The classification of histamine receptors has to date been based on rigorous classical pharmacological analysis, and as yet, the classification of the three histamine receptors that have been defined by this process, (i.e., the H1-, H2-, andH3-receptors) have not been added to because of more recent molecular biological approaches (Schwartz et al., 1991, 1995; Hill, 1990; Leurs et al., 1995b). The scant number of known histamine receptors, compared with the plethora of receptors for some other endogenous substances, probably reflects the relative neglect of histamine rather than a paucity of its receptors. There is some preliminary evidence of heterogeneity of the known histamine receptors (which will be reviewed later in this article), but the acceptance of additional subtypes still awaits the identification of “sequence differences” within a single species and the development of selective agonists and antagonists providing the structural, recognition, and transductional information necessary for reliable classification. The first histamine receptor antagonists (popularly referred to as the classical antihistamines but now called H1-receptor antagonists) were synthesized (Bovet and Staub, 1936; Bovet, 1950) over 20 years after the discovery (Barger and Dale, 1910) and descriptions of some of the physiological effects (Dale and Laidlaw, 1910) of histamine. These accomplishments had been preceded, as for some other endogenous biogenic amines, by its synthesis as a chemical curiosity (Windaus and Vogt, 1907). Early studies of the antihistamines were qualitative, for example, the demonstration of their effectiveness in protecting against bronchospasm produced in guinea pigs by anaphylaxis or administration of histamine (Bovet and Staub, 1936). Though qualitative, these studies yielded compounds, e.g., mepyramine (pyrilamine), that remain major ligands to define histamine receptors. These antagonists were shown to reduce the effects of histamine on many tissues, notably vascular and extravascular smooth muscle (e.g., guinea pig ileum), but it became apparent that some of the effects of histamine were refractory to these classical antihistamines (Loew, 1947). For example, histamine-stimulated gastric secretion was shown to be unresponsive to three different antihistamines (Ashford et al., 1949). The vasodilator response to histamine in the cat was shown to be only partly sensitive to an antihistamine, leading to the suggestion that histamine causes vasodilatation by combining with more than one receptor (Folkow et al., 1948). The application of the method of Schild (Arunlakshana and Schild, 1959) to the classification of receptors revealed that the pA2 (−log KB) value of mepyramine for antagonism of the positive chronotropic effect of histamine on the right atrium of the guinea pig differed from mepyramine’s pA2 value for antagonism of the contractile response to histamine in guinea pig ileum, implying that the receptors involved were distinct (Arunlakshana and Schild, 1959; Trendelenburg, 1960). The histamine receptor in guinea pig ileum and in other tissues that showed the same or similar pA2 value for these early antihistamines was then named the H1-receptor (Ash and Schild, 1966). As the relative potencies of these histamine antagonists and histamine agonists on gastric acid secretion, relaxation of rat uterus, and chronotropy of the guinea pig right atrium differed from those on the H1-receptor, it was concluded that a separate histamine receptor was involved in these responses. The development of specific antagonists (H2-antagonists) for this novel receptor represents a classic example of rational drug design (Black et al., 1972; Black, 1989) and showed the “practical value” (Green and Maayani, 1987; Jenkinson, 1987) of a quantitative approach to the analysis of receptor antagonism (Arunlakshana and Schild, 1959). Burimamide was the first compound to be described (Black et al., 1972) that had a higher pA2 for antagonism of the histamine-mediated responses on guinea pig atrium and rat uterus than the pA2 determined for antagonism of the contractile response to histamine in guinea pig ileum. Burimamide was also able to reduce gastric acid secretion in dogs and humans and to reduce the blood pressure response of the cat to histamine (Black et al., 1972). A large number of more potent and selective H2-receptor antagonists have since been developed (Cooper et al., 1990), although further quantitative investigations of the antagonist potency of burimamide on other histamine-mediated responses contributed to the definition and classification of the histamine H3-receptor (Arrang et al., 1983). The third histamine receptor was also defined by a functional assay. Histamine was found to inhibit its own synthesis and release in rat cerebral cortical slices, and the effects of H1- and H2- receptor agonists and antagonists indicated a distinct receptor (Arrang et al., 1983, 1987b). A highly selective agonist, R-(α)-methylhistamine, and antagonist, thioperamide, clearly defined theH3-receptor (Arrang et al., 1987). Since that time, considerable efforts have been made to develop otherH3-receptor–selective agonists and antagonists (Garbarg et al., 1992; Jansen et al., 1992; Van der Goot et al., 1992; Vollinga et al., 1994; Ganellin et al., 1995; Ligneau et al., 1995; Stark et al., 1996b,c). Table 1 summarizes some of the operational characteristics used to define the nature of the histamine receptor involved in different tissue responses. Histamine derivatives are numbered according to the system given in figure1 (Black and Ganellin, 1974). The study of the distribution of histamine H1-receptors in different mammalian tissues has been greatly aided by the development of selective radioligands for this particular histamine receptor subtype. [3H]mepyramine was originally developed in 1977 (Hill et al., 1977) and since that time has been used successfully to detect H1-receptors in a wide variety of tissues including: mammalian brain; smooth muscle from airways, gastrointestinal tract, genitourinary system, and the cardiovascular system; adrenal medulla; and endothelial cells and lymphocytes (Hill, 1990). In some tissues and cells, however, it is notable that [3H]mepyramine additionally binds to secondary non-H1–receptor sites (Chang et al., 1979a; Hill and Young, 1980; Hadfield et al., 1983; Mitsuhashi and Payan, 1988;Arias-Montano and Young, 1993; Dickenson and Hill, 1994; Leurs et al., 1995b). In rat liver, in which [3H]mepyramine predominantly binds to a protein homologous with debrisoquine 4-hydroxylase cytochrome P450 (Fukui et al., 1990), quinine can be used to inhibit this nonspecific binding. This observation has led Liu et al. (1992) to suggest that quinine may be used to inhibit binding to other lower affinity sites. However, it is clear that not all secondary binding sites for [3H]mepyramine are sensitive to inhibition by quinine (Dickenson and Hill, 1994). Thus, in DDT1MF-2 cells, a 38 to 40 kDa protein has been isolated, which binds H1-receptor antagonists with KD values in the micromolar range (Mitsuhashi and Payan, 1988, Mitsuhashi et al., 1989) but which is not sensitive to inhibition by quinine (Dickenson and Hill, 1994). Nevertheless, DDT1MF-2 cells can be shown to additionally possess [3H]mepyramine binding sites that have the characteristics of H1-receptors (i.e., KDvalues in the nanomolar range) and to mediate functional responses, which are clearly produced by histamine H1-receptor activation (Dickenson and Hill, 1992;White et al., 1993; Dickenson and Hill, 1994). Other radioligands that have been used to study histamine H1-receptors are [3H]mianserin (Peroutka and Snyder, 1981), [3H]doxepin (Tran et al., 1981; Kamba and Richelson, 1984; Taylor and Richelson, 1982), [125I]iodobolpyramine (Bouthenet et al., 1988), [125I]iodoazidophenpyramine (Ruat et al., 1988), and [3H](+)-N-methyl-4-methyldiphenhydramine (Treherne and Young, 1988b). [125I]Iodobolpyramine has been used for autoradiographic localization of H1-receptors in guinea pig brain, although less success has been achieved in rat brain (Körner et al., 1986; Bouthenet et al., 1988). The very slow dissociation of [3H]mepyramine from H1-receptors at low temperatures (e.g., 4°C) does, however, mean that this ligand can also be used for autoradiography (Palacios et al., 1981a,b; Rotter and Frostholm, 1986). [125I]Iodoazidophenpyramine is a very potent H1-receptor antagonist that can bind irreversibly to H1-receptors following irradiation with ultraviolet light (Ruat et al., 1988). [11C]Mepyramine and [11C]doxepin have also proved useful for imaging histamine H1-receptors in the living human brain (Villemagne et al., 1991; Yanai et al., 1992, 1995). H1-receptors have been extensively studied in blood vessels (Barger and Dale, 1910; Dale and Laidlaw, 1910; Folkow et al., 1948; Black et al., 1972) and other smooth muscle preparations (Ash and Schild, 1966; Black et al., 1972; Marshall, 1955; Hill, 1990). In smooth muscles, such as the guinea pig ileum, which freely generate muscle action potentials, modulation of action-potential discharge by low concentrations of histamine is an important mechanism by which tension is increased (Bolton, 1979; Bolton et al., 1981; Bülbring and Burnstock, 1960). In guinea pig ileum, there is also evidence that a component of the contractile response to histamine is mediated by inositol 1,4,5-trisphosphate–induced mobilization of intracellular calcium (Morel et al., 1987; Bolton and Lim, 1989; Donaldson and Hill, 1986b). In nonexcitable smooth muscles, such as airway and vascular smooth muscle, contractile responses to H1-receptor stimulation primarily involve mobilization of calcium from intracellular stores as a consequence of inositol phospholipid hydrolysis (Matsumoto et al., 1986; Kotlikoff et al., 1987; Takuwa et al., 1987; Hall and Hill, 1988;Paniettieri et al., 1989; Van Amsterdam et al., 1989). In vascular endothelial cells, H1-receptor stimulation leads to several cellular responses including: (a) changes in vascular permeability (particularly in postcapillary venules) as a result of endothelial cell contraction (Majno and Palade, 1961; Majno et al., 1968; Meyrick and Brigham, 1983;Grega, 1986; Killackey et al., 1986; Svensjo and Grega, 1986); (b) prostacyclin synthesis (McIntyre et al., 1985;Brotherton, 1986; Carter et al., 1988; Resink et al., 1987); (c) synthesis of platelet-activating factor (McIntyre et al., 1985); (d) release of Von Willebrand factor (Hamilton and Sims, 1987); and (e) release of nitric oxide (Van De Voorde and Leusen, 1993; Toda, 1984). The H1-receptor has also been characterized on human T lymphocytes using [125I]iodobolpyramine (Villemain et al., 1990) and shown to increase [Ca2+]i (Kitamura et al., 1996). Histamine H1-receptors have long been established to be present in the adrenal medulla and to elicit the release of catecholamines (Emmelin and Muren, 1949; Staszewska-Barczak and Vane, 1965; Robinson, 1982; Livett and Marley, 1986; Noble et al., 1988). Thus, histamine can induce the release of both adrenaline and noradrenaline from cultured bovine adrenal chromaffin cells (Livett and Marley, 1986). In these cells, histamine can also stimulate phosphorylation of the catecholamine biosynthesis enzyme tyrosine hydroxylase via a mechanism that involves release of intracellular calcium (Bunn et al., 1995). In addition to its effects on catecholamine synthesis and release from adrenal chromaffin cells, histamine can also elicit the release of leucine- and methionine-enkephalin (Bommer et al., 1987). Furthermore, after prolonged exposure to histamine, there is a marked increase in messenger ribonucleic acid-encoding proenkephalin A (Bommer et al., 1987; Kley, 1988; Wan et al., 1989). In human atrial myocardium and guinea pig ventricle, histamine produces negative inotropic effects (Guo et al., 1984; Genovese et al., 1988; Zavecz and Levi, 1978). In human myocardium, this response is associated with inhibitory effects on heart rate and can be unmasked when the positive effects of histamine on the rate and force of contraction (mediated via H2-receptors) are attenuated by conjoint administration of adenosine or adenosine A1-receptor agonists (Genovese et al., 1988). However, in guinea pig left atria (Reinhardt et al., 1974, 1977;Steinberg and Holland, 1975; Hattori et al., 1983, 1988a) and rabbit papillary muscle (Hattori et al., 1988b), histamine produces a positive inotropic response via a mechanism that is not associated with a rise in adenosine 3c,5c-cyclic monophosphate (cAMPb) levels (see Hill, 1990). Histamine H1-receptors are widely distributed in mammalian brain (Hill, 1990; Schwartz et al., 1991). In human brain, higher densities of H1-receptors are found in neocortex, hippocampus, nucleus accumbens, thalamus, and posterior hypothalamus, whereas cerebellum and basal ganglia show lower densities (Chang et al., 1979b; Kamba and Richelson, 1984; Martinez-Mir et al., 1990; Villemagne et al., 1991; Yanai et al., 1992). The distributions in rat (Palacios et al., 1981a) and guinea pig (Palacios et al., 1981b;Bouthenet et al., 1988) are similar to each other and to humans with the exception that the guinea pig cerebellum shows high density (Ruat and Schwartz, 1989; Chang et al., 1979b; Hill and Young, 1980; Palacios et al., 1981b; Bouthenet et al., 1988). In most brain areas, there was overlap of H1-receptor binding sites and messenger ribonucleic acid levels except in hippocampus and cerebellum in which the discrepancy is likely to reflect the presence of abundant H1-receptors in dendrites of pyramidal and Purkinje cells, respectively (Traiffort et al., 1994). Histamine H1-receptor activation causes inhibition of firing and hyperpolarization in hippocampal neurons (Haas, 1981) and an apamine-sensitive outward current in olfactory bulb interneurons (Jahn et al., 1995), effects most likely produced by intracellular Ca2+ release. However, many other notably vegetative ganglia (Christian et al., 1989), hypothalamic supraoptic (Haas et al., 1975), brainstem (Gerber et al., 1990; Khateb et al., 1990), thalamic (McCormick and Williamson, 1991), and human cortical neurons (Reiner and Kamondi, 1994) are excited by histamine H1-receptor activation through a block of a potassium conductance. Although a large number of compounds have been synthesized as selective and competitive antagonists of the histamine H1-receptor (see for example Casy, 1977;Ganellin, 1982), chemical effort directed at the generation of highly potent and selective H1-receptor agonists has not achieved the same success. Modification of the ethylamine side chain of histamine is not favorable for H1-receptor agonism (Leurs et al., 1995b). Furthermore, resolution of the enantiomers of the chiral compounds generated by methylation of the α- or β-positions did not reveal any stereoselectivity of the side chain for the H1-receptor (Arrang et al., 1987;Leurs et al., 1995). Alkylation of the side chain amine group does not drastically reduce H1-receptor activity, but Nα- and Nα,Nα-dimethylhistamine are also potent agonists for theH3-receptor (table2; fig. 2;Arrang et al., 1983). Modification of the imidazole moiety of histamine has been the most successful approach for obtaining agonists with selectivity for the H1-receptor. Replacement of the imidazole moiety of histamine by other aromatic heterocyclic ring structures in 2-pyridylethylamine and 2-thiazolylethylamine yields two compounds with selectivity for the H1-receptor (table 2; fig. 2). Both compounds act as full agonists in producing contraction of guinea pig ileum (Donaldson and Hill, 1986c), but in other tissues (e.g., guinea pig cerebral cortical slices or DDT1MF-2 cells), 2-pyridylethylamine behaves as a low-efficacy agonist (Donaldson and Hill, 1986a; White et al., 1993). Substitutions in the 2-position of the imidazole ring of histamine have produced compounds that are the most selective H1-agonists available (Zingel et al., 1995). Thus, 2(3-bromophenyl)histamine and 2[3-(trifluoromethyl)phenyl]histamine are both relatively potent and highly selective H1-agonists (table 2; fig.2; Leschke et al., 1995). Both compounds appear to be potent H1-agonists in guinea pig ileum (Leschke et al., 1995), although some of the halogenated 2-phenylhistamines are low-efficacy agonists in DDT1MF-2 cells (Zingel et al., 1990; White et al., 1993) and in guinea pig aorta (Leschke et al., 1995) and can exhibit partial agonist properties. Mepyramine (also known as pyrilamine) is the reference selective and high-affinity H1-receptor antagonist (table3; Hill, 1990). 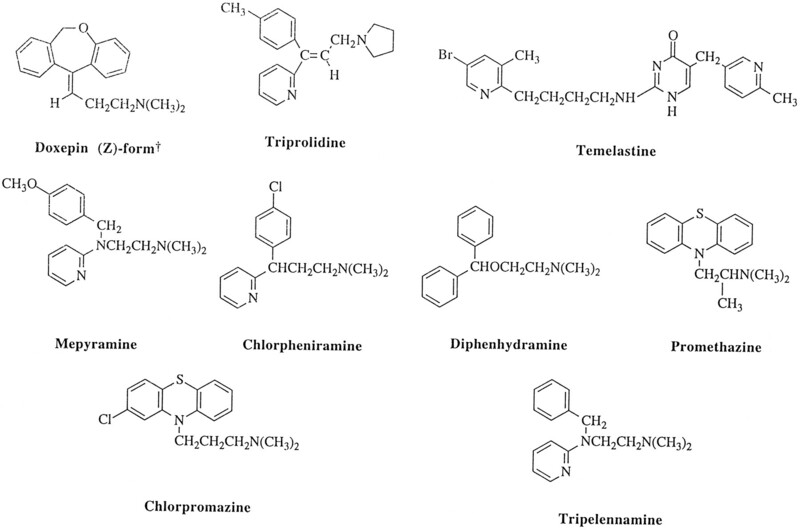 Other classical H1-antagonists that have been used for characterization purposes include chlorpheniramine, tripelennamine, promethazine, and diphenhydramine (fig.3). Some of these, however, possess marked muscarinic receptor antagonist properties (Hill, 1990, 1987), and consequently the selectivity of these compounds between the three different histamine receptors (table 3) does not guarantee an unambiguous characterization. This can only be achieved by appropriate quantitative assessment of receptor antagonism, preferably with a range of compounds of very different chemical structure. The stereoisomers of chlorpheniramine are particularly useful in this regard (table 3). The enantiomers of 4-methyl-diphenhydramine and brompheniramine also differ by two orders of magnitude in their affinity for the H1-receptor (Chang et al., 1979b; Treherne and Young, 1988b). The geometric isomer trans-triprolidine is three orders of magnitude more potent than its cis counterpart and is one of the most potent H1-antagonists available for the guinea pig H1-receptor (tables 3 and4; Ison et al., 1973). The tricyclic antidepressants amitriptyline and doxepin are also very potent H1-receptor antagonists (KD0.6 and 0.1 nm respectively; Figge et al., 1979; Aceves et al., 1985). At therapeutic dosages, many of the classical H1-antihistamines give rise to sedative side effects that have been attributed to occupancy of H1-receptors in the central nervous system (CNS) (Schwartz et al., 1981; Nicholson et al., 1991; Leurs et al., 1995b). Most of the classical H1-antihistamines, including promethazine and (+)-chlorpheniramine, readily cross the blood-brain barrier. However, several compounds that penetrate poorly into the CNS and appear to be devoid of central depressant effects are now available (fig. 4). These include terfenadine (Rose et al., 1982; Wiech and Martin, 1982), astemizole (Laduron et al., 1982; Niemegeers et al., 1982), mequitazine (Uzan and Le Fer, 1979), loratadine (Ahn and Barnett, 1986), acrivastine (Leighton et al., 1983; Cohen et al., 1985), cetirizine (Timmerman, 1992b), and temelastine (Brown et al., 1986; Calcutt et al., 1987). The pKi values for these agents are given in table5 (Ter Laak et al., 1994). Photoaffinity binding studies using [125I]iodoazidophenpyramine and subsequent sodium dodecyl sulfate-polyacrylamide gel electrophoresis analysis have indicated that the H1-receptor protein has a molecular weight of 56 kDa under reducing conditions in rat, guinea pig, and mouse brain (Ruat et al., 1988, 1990b; Ruat and Schwartz, 1989). Similarly, studies in bovine adrenal medullar membranes with another photoaffinity ligand [3H]azidobenzamide (Yamashita et al., 1991b) found labeled peptides in the size range 53 to 58 kDa. Interestingly, the specifically labeled H1-receptor (with [125I]iodoazidophenpyramine) in guinea pig heart was found to have a substantially higher molecular weight, although there is no obvious difference in the pharmacological characteristics of the H1-receptor in this tissue (Ruat et al., 1990a). The bovine adrenal medulla H1-receptor was cloned in 1991 by expression cloning in the Xenopus oocyte system (Yamashita et al., 1991a). The deduced amino acid sequence represents a 491 amino acid protein with a calculated molecular weight of 56 kDa (table 6). The protein has the seven putative transmembrane (TM) domains expected of a G-protein–coupled receptor and possesses N-terminal glycosylation sites. A striking feature of the proposed structure is the very large third intracellular loop (212 amino acids) and relatively short (17 amino acids) intracellular C terminal tail. The availability of the bovine sequence and lack of introns has enabled the H1-receptor to be cloned from several species (table 6) including rat (Fujimoto et al., 1993), guinea pig (Horio et al., 1993; Traiffort et al., 1994), mouse (Inove et al., 1996), and human (De Backer et al., 1993; Fukui et al., 1994; Moguilevsky et al., 1994; Smit et al., 1996c). The human histamine H1-receptor gene has now been localized to chromosome 3 bands 3p14-p21 (Le Coniat et al., 1994). At the present time, these different clones should be regarded as true species homologues of the histamine H1-receptor, even though there are notable differences between them in some antagonist potencies (table 4). Unfortunately, the number of H1-receptor antagonists evaluated in binding studies in cells transfected with the different recombinant receptors is rather limited. Nevertheless, it is clear that the stereoisomers of chlorpheniramine show marked differences between species. For example, the guinea pig H1-receptor has a KD of 0.9 nm for (+)-chlorpheniramine, whereas for the rat H1-receptor, the value is nearer 8 nm(table 4). 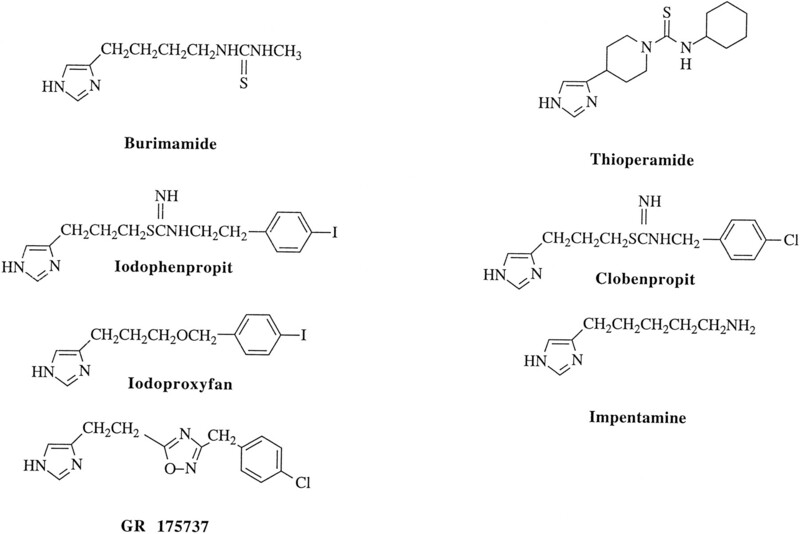 Similar differences for this compound and others (notably mepyramine and triprolidine) have been reported for the native H1-receptors in guinea pig and rat brain, respectively (table 4; Chang et al., 1979b; Hill and Young, 1980; Hill, 1990). Such species differences may also explain why [125I]iodobolpyramine can label guinea pig CNS H1-receptors but is unable to detect H1-receptors in rat brain (Körner et al., 1986; Bouthenet et al., 1988). The native H1-receptor protein has been solubilized from both guinea pig and rat brain membranes (Toll and Snyder, 1982;Treherne and Young, 1988a), and the solubilized receptor retains the same differences in H1-antagonist potency for (+)-chlorpheniramine as that observed in membranes (Toll and Snyder, 1982). What is not clear, however, is why mepyramine appears to be more potent as an antagonist of the recombinant rat H1-receptor (expressed in C6 cells) than it is of the native H1-receptor in rat brain membranes (table 4; Chang et al., 1979b; Hill and Young, 1980; Fujimoto et al., 1993). The recombinant study performed in rat C6 cells (Fujimoto et al., 1993) is complicated by the presence of a low level of endogenous H1-receptors (Peakman and Hill, 1994), but a high affinity for mepyramine (KD = 1 nm) has been deduced from functional studies in untransfected C6 cells (table 4; Peakman and Hill, 1994). Site-directed mutagenesis has begun to shed some light on the binding domains for H1-agonists and -antagonists. Amino acid sequence alignment of the cloned histamine H1- and H2-receptors (see fig. 5) has led to the suggestion that the third (TM3) and fifth (TM5) transmembrane domains of the receptor proteins are responsible for binding histamine (Birdsall, 1991;Timmerman, 1992a). Aspartate (107) in TM3 of the human H1-receptor, which is conserved in all aminergic receptors, has been shown to be essential for the binding of histamine and H1-receptor antagonists to the H1-receptor (Ohta et al., 1994). In the α2- and β2-adrenoceptors, two serine residues in TM5 accept the phenolic hydroxyl groups of the catechol ring of noradrenaline. In the H1-receptor, the residues corresponding to asparagine (198) and threonine (194) are in corresponding positions in TM5 of the human H1-receptor. However, substitution of an alanine for threonine (194) did not influence either agonist or antagonist binding (Ohta et al., 1994; Moguilevsky et al., 1995). Substitution of alanine (198) for asparagine (198) substantially decreased agonist, but not antagonist affinity (Ohta et al., 1994; Moguilevsky et al., 1995). Similar mutations to the corresponding residues (threonine (203) and asparagine (207) in the guinea pig H1-receptor sequence produce very similar results (Leurs et al., 1994a). It is interesting to note, however, that whereas 2-methylhistamine is similarly affected by the asparagine207 alanine mutation, the H1-selective agonists 2-thiazolylethylamine, 2-pyridylethylamine, and 2-(3-bromophenyl)histamine are much less affected by this mutation (Leurs et al., 1994a). These data suggest that asparagine (207) interacts with the Nτ-nitrogen of the imidazole ring of histamine. Furthermore, Leurs et al. (1995a) have recently shown that lysine (200) interacts with the Nπ-nitrogen of histamine and is important for the activation of the H1-receptor by histamine and the nonimidazole agonist, 2-pyridylethylamine. Interestingly, however, the lysine (200) alanine mutation did not alter the binding affinity of 2-pyridylethylamine to the guinea pig H1-receptor (Leurs et al., 1995). The primary mechanism by which histamine H1-receptors produce functional responses in cells is the activation of phospholipase C via a pertussis toxin-insensitive G-protein that is probably related to the Gq/11 family of G-proteins (Hill, 1990; Leurs et al., 1995b). The number of tissues and cell types in which a histamine H1-receptor–mediated increase in either inositol phosphate accumulation or intracellular calcium mobilization has been described is extensive, and further details are provided in several comprehensive reviews (Hill, 1990; Hill and Donaldson, 1992; Leurs et al., 1995b). Stimulation by histamine of [3H]inositol phosphate accumulation and calcium mobilization has also been observed in Chinese hamster ovary (CHO) cells transfected with the human, bovine, and guinea pig H1-receptor complementary deoxyribonucleic acid (cDNA) (Leurs et al., 1994c; Smit et al., 1996c; Iredale et al., 1993;Megson et al., 1995). It is worth noting, however, that in some tissues, histamine can stimulate inositol phospholipid hydrolysis independently of H1-receptors. Thus, in the longitudinal smooth muscle of guinea pig ileum and neonatal rat brain (Donaldson and Hill, 1985, 1986b; Claro et al., 1987), a component can be identified in the response to histamine that is resistant to inhibition by H1-receptor antagonists. It remains to be established, however, whether these effects are due to “tyramine-like” effects of histamine on neurotransmitter release (Bailey et al., 1987; Young et al., 1988a) or direct effects of histamine on the associated G-proteins (Seifert et al., 1994). In addition to effects on the inositol phospholipid signaling systems, histamine H1-receptor activation can lead to activation of several other signaling pathways, many of which appear to be secondary to changes in intracellular calcium concentration or the activation of protein kinase C. Thus, histamine can stimulate nitric oxide synthase activity (via a Ca2+/calmodulin-dependent pathway) and subsequent activation of soluble guanylyl cyclase in a variety of different cell types (Schmidt et al., 1990; Leurs et al., 1991a; Yuan et al., 1993;Casale et al., 1985; Duncan et al., 1980; Hattori et al., 1990; Sertl et al., 1987). Arachidonic acid release and the synthesis of arachidonic acid metabolites such as prostacyclin and thromboxane A2 can also be enhanced by H1-receptor stimulation (Carter et al., 1988;Resink et al., 1987; Leurs et al., 1994c; Muriyama et al., 1990). Interestingly, in CHO-K1 cells transfected with the guinea pig H1-receptor, the histamine-stimulated release of arachidonic acid is partially inhibited (approximately 40%) by pertussis toxin, whereas the same response in HeLa cells possessing a native H1-receptor was resistant to pertussis toxin treatment (Leurs et al., 1994c). The reason for this difference remains to be established, but it does caution against the use of signal transduction pathways in highly expressed recombinant cell systems as a primary receptor classification tool. This point is best illustrated by the fact that in intact cellular systems, H1-receptor activation can produce substantial changes in the intracellular levels of cAMP. In most tissues, histamine H1-receptor activation does not activate adenylyl cyclase directly but acts to amplify direct cAMP responses to histamine H2-, adenosine A2-, and vasoactive intestinal polypeptide receptors (Palacios et al., 1978;Al-Gadi and Hill, 1987, 1985; Donaldson et al., 1989; Garbarg and Schwartz, 1988; Magistretti and Schorderet, 1985; Marley et al., 1991). In many of these cases, a role for both intracellular Ca2+ ions and protein kinase C has been implicated in this augmentation response (Al-Gadi and Hill, 1987;Schwabe et al., 1978; Garbarg and Schwartz, 1988). In CHO cells transfected with the bovine or guinea pig H1-receptor, H1-receptor activation can also lead to both direct cAMP responses and to an enhancement of forskolin-stimulated cAMP formation (Leurs et al., 1994c; Sanderson et al., 1996). Unlike the situation with H1-selective radioligands, attempts to map the distribution of H2-receptors by using radiolabeled H2-receptor antagonists have met with variable success (Hill, 1990). Thus, [3H]cimetidine and [3H]ranitidine have proved unsuitable as H2-radioligands, and in the case of cimetidine, the binding to sites specifically labeled with the radioligand is potently inhibited by imidazoles that have very low H2-receptor binding affinities (Burkard, 1978;Kendall et al., 1980; Smith et al., 1980; Bristow et al., 1981;Warrender et al., 1983). More success has been achieved with [3H]tiotidine, which has a higher affinity for the H2-receptor (table7) in guinea pig brain, lung parenchyma, and CHO-K1 cells transfected with the human H2-receptor cDNA (Gajtkowski et al., 1983; Norris et al., 1984; Sterk et al., 1986; Foreman et al., 1985a; Gantz et al., 1991a), although studies in rat brain were not successful (Maayani et al., 1982). At the present time, [125I]iodoaminopotentidine is the most successful H2-radioligand (Hirschfeld et al., 1992). It has high affinity (KD = 0.3 nm) for the histamine H2-receptor in brain membranes (Martinez-Mir et al., 1990; Ruat et al., 1990b;Traiffort et al., 1992a) and CHO-K1 cells expressing the cloned rat H2-receptor (Traiffort et al., 1992b). The compound has also been used for autoradiographic mapping of H2-receptors in mammalian brain (Ruat et al., 1990a; Traiffort et al., 1992a). In human brain, histamine H2-receptors are widely distributed with highest densities (measured using [125I]iodoaminopotentidine) in the basal ganglia, hippocampus, amygdala, and cerebral cortex (Traiffort et al., 1992a). Lowest densities were detected in cerebellum and hypothalamus (Traiffort et al., 1992a). A similar distribution has been observed in guinea pig brain (Ruat et al., 1990b). [125I]Iodoazidopotentidine has successfully been used for irreversible labeling (Ruat et al., 1990b; Hirschfeld et al., 1992). Most information to date on the distribution of histamine H2-receptor, however, has been provided by functional studies in different tissues (Hill, 1990). Histamine H2-receptor–stimulated cAMP accumulation or adenylyl cyclase activity has been demonstrated in a variety of tissues including brain (Hegstrand et al., 1976; Green et al., 1977; Kanof et al., 1977; Palacios et al., 1978; Gajtkowski et al., 1983; Al-Gadi and Hill, 1985, 1987), gastric cells (Soll and Wollin, 1979; Gespach et al., 1982), and cardiac tissue (Johnson et al., 1979a,b; Kanof and Greengard, 1979a; Johnson, 1982). Histamine H2-receptors have a potent effect on gastric acid secretion, and the inhibition of this secretory process by H2-receptor antagonists has provided evidence for an important physiological role of histamine in the regulation of gastric secretion (Black et al., 1972; Black and Shankley, 1985; Soll and Berglindh, 1987). High concentrations of histamine are also present in cardiac tissues of most animal species and can mediate positive chronotropic and inotropic effects on atrial or ventricular tissues via H2-receptor stimulation (Black et al., 1972; Inui and Imamura, 1976; Levi et al., 1982; Hattori et al., 1983; Hattori and Levi, 1984; Hescheler et al., 1987; Levi and Alloatti, 1988). H2-receptor–mediated smooth muscle relaxation has also been documented in airway, uterine, and vascular smooth muscle (Black et al., 1972; Reinhardt and Ritter, 1979; Gross et al., 1981;Eyre and Chand, 1982; Edvinsson et al., 1983; Foreman et al., 1985b;Ottosson et al., 1989). Finally, histamine H2-receptors can inhibit a variety of functions within the immune system (Hill, 1990). H2-receptors on basophils and mast cells have been shown to negatively regulate the release of histamine (Bourne et al., 1971; Lichtenstein and Gillespie, 1975; Lett-Brown and Leonard, 1977; Ting et al., 1980; Plaut and Lichtenstein, 1982). Furthermore, there is increasing evidence that H2-receptors on lymphocytes can inhibit antibody synthesis, T-cell proliferation, cell-mediated cytolysis, and cytokine production (Bourne et al., 1971;Melmon et al., 1974, 1981; Griswold et al., 1984; Khan et al., 1985,1986; Sansoni et al., 1985; Melmon and Khan, 1987). In the CNS, histamine H2-receptor activation can inhibit nerve cells (Haas and Bucher, 1975; Haas and Wolf, 1977), but the most intriguing action is a block of the long-lasting after-hyperpolarization and the accommodation of firing, an effect with a remarkably long duration leading to potentiation of excitation in rodents (Haas and Konnerth, 1983; Haas and Greene, 1986) and human brain (Haas et al., 1988). A slow excitation is also common (Greene and Haas, 1989; Phelan et al., 1990). Synaptic transmission in the hippocampus is profoundly enhanced (Kostopoulos et al., 1988), and synaptic plasticity is induced or enhanced (Brown et al., 1995). An increase of the hyperpolarization-activated current has also been described in thalamic relay neurons (McCormick and Williamson, 1991). Indications for non-cAMP mediated actions of H2-receptor activation are given by Haas et al. (1978) and Jahn et al. (1995). The initial definition of the H1- and H2-subclasses of histamine receptor by Ash and Schild (1966) and Black and colleagues (1972) led to a successful search for H2-receptor selective antagonists with clinical relevance for the treatment of peptic ulcer. Burimamide was the first compound developed that showed selectivity for the H2-receptor (Black et al., 1972), but more recent work has shown that this compound is a more potentH3-receptor antagonist (Arrang et al., 1983). Cimetidine and metiamide were developed directly from burimamide (Black et al., 1974; Brimblecombe et al., 1975; Ganellin, 1978). Since then, a large number of compounds have been developed with H2-receptor antagonist properties [see Ganellin (1992) for review]. 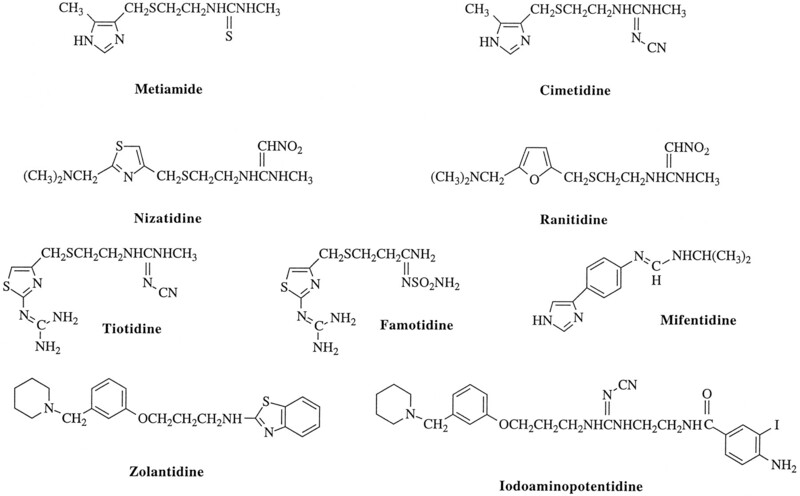 These include ranitidine (Bradshaw et al., 1979), tiotidine (Yellin et al., 1979), nizatidine (Lin et al., 1986), famotidine (Takeda et al., 1982), and mifentidine (Donetti et al., 1984), which have been extensively used for characterization purposes (table 3; fig. 6). Iodoaminopotentidine (KD = 2.5 nm) is one of the most potent H2-receptor antagonists available, and, as mentioned above, this compound has been used as a successful radioligand (Hirschfeld et al., 1992). Most H2-receptor antagonists are polar compounds and penetrate poorly into the CNS. Although this property is of great use for selective actions on peripheral tissues (e.g., gastric mucosa), it does limit the use of the compounds for the in vivo evaluation of H2-receptor function within the CNS. However, one compound (zolantidine) is a potent and selective brain-penetrating histamine H2-receptor antagonist (table 3;Calcutt et al., 1988; Young et al., 1988b). Both cimetidine and ranitidine have been shown to demonstrate inverse agonism on histamine H2-receptors transfected into CHO cells (Smit et al., 1996a). Thus, in CHO cells expressing high levels of H2-receptors, in which a considerable constitutive activation of H2-receptors was demonstrated, cimetidine and ranitidine inhibited basal adenylyl cyclase activity (Smit et al., 1996a). In contrast, burimamide behaved as a neutral antagonist (Smit et al., 1996a). 4-Methylhistamine was the first agonist described that had any selectivity for the H2-receptor (Black et al., 1972), although more potent and selective H2-agonists are now available (table 2). It is noteworthy that many of the selective H2-agonists exhibit H1- orH3-antagonist properties (see table 2); consequently the demonstration of H2-agonism in a given tissue or cell type needs confirming with H2-antagonists. Impromidine is approximately 48 times more potent than histamine in mediating atrial chronotropic responses, but in several other H2-receptor–containing tissues, its relative potency and efficacy are lower (Durant et al., 1978; Leurs et al., 1995b). 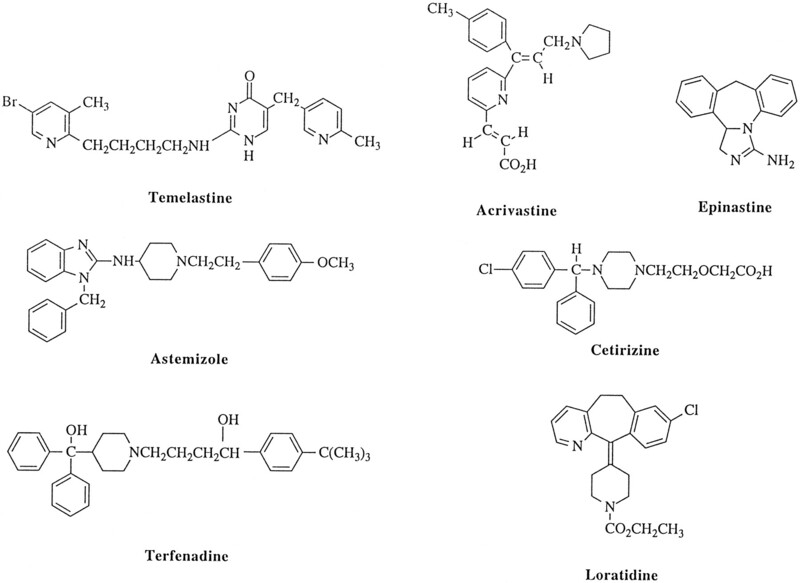 A large number of impromidine analogues have been synthesized and evaluated for H2-agonism. These studies have led to the development of the potent H2-agonists, sopromidine and arpromidine (table 2; Timmerman, 1992c). Arpromidine and analogues are potential candidates for treatment of congestive heart failure (Buschauer, 1989; Buschauer and Baumann, 1991;Mörsdorf et al., 1990). Another potent H2-agonist has been derived as an analogue of dimaprit by considering cyclic forms of the isothiourea group (Eriks et al., 1992). Photoaffinity binding studies using [125I]iodoazidopotentidine and sodium dodecyl sulfate-polyacrylamide gel electrophoresis have suggested that the H2-receptor in guinea pig hippocampus and striatum has a molecular weight of 59 kDa (Ruat et al., 1990b). However, comparison with the calculated molecular weights (40.2 to 40.5 kDa) for the recently cloned H2-receptors (table 6) suggests that the native H2-receptor in guinea pig brain is glycosylated. Consistent with this proposal, it is noteworthy that all of the cloned H2-receptor proteins possess N-glycosylation sites in the N-terminus region (Gantz et al., 1991a,b; Ruat et al., 1991; Traiffort et al., 1995). Removal of these glycosylation sites by site-directed mutagenesis, however, has shown that N-glycosylation of the H2-receptor is not essential for cell surface localization, ligand binding, or coupling via Gs to adenylyl cyclase (Fukushima et al., 1995). The H2-receptor was first cloned by Gantz and colleagues using the polymerase chain reaction to amplify a partial length H2-receptor sequence from canine gastric parietal cDNA using degenerate oligonucleotide primers (Gantz et al., 1991b). This sequence was then used to identify a full length H2-receptor clone following screening of a canine genomic library (Gantz et al., 1991b). Rapid cloning of the rat, human, guinea pig, and mouse H2-receptors followed (Gantz et al., 1991a; Ruat et al., 1991; Traiffort et al., 1995;Kobayashi et al., 1996). These DNA sequences encode for a 359 (canine, human, guinea pig) or 358 (rat) receptor protein that has the general characteristics of a G-protein-coupled receptor. The most notable difference between the structure of the cloned H2- and H1- receptors is the much shorter 3rd intracellular loop of the H2-receptor and the longer H2-receptor C terminus. Expression of the rat and human H2-receptor proteins in CHO cells has revealed the expected pharmacological specificity of H2-receptors as judged by radioligand binding studies using [125I]iodoaminopotentidine (Traiffort et al., 1992b; Leurs et al., 1994c). Recent chromosomal mapping studies have assigned the H2-receptor gene to human chromosome 5 (Traiffort et al., 1995). Comparison of the H2-receptor sequence with other biogenic amine G-protein–coupled receptors has indicated that an aspartate in TM3 and an aspartate and threonine residue in TM5 are responsible for binding histamine (Birdsall, 1991). Replacement of aspartate (98) by an asparagine residue in the canine H2-receptor results in a receptor that does not bind the antagonist tiotidine and does not stimulate cAMP accumulation in response to histamine (Gantz et al., 1992). Similarly, changing the aspirate (186) of TM5 to an alanine resulted in complete loss of tiotidine binding without affecting the EC50 for histamine-stimulated cAMP formation (Gantz et al., 1992). Changing the threonine (190) to an alanine, however, resulted in a lower KD for tiotidine and a reduction in both the maximal cAMP response and histamine EC50 value (Gantz et al., 1992). Mutation of Asp (186) and Gly (187) in the canine H2-receptor (to Ala (186) and Ser (187), however, produces a bifunctional receptor that can be stimulated by adrenaline and inhibited by both propranolol and cimetidine (Delvalle et al., 1995). Thus, these data suggest that the pharmacological specificity of the H2-receptor resides in only a few key amino acid residues. Other site-directed mutagenesis studies on the H2-receptor have been very limited. However, Smit et al. (1996) have identified a residue in the second intracellular loop [leucine (124)] of the rat H2-receptor, which appears necessary for efficient coupling to Gs. It is generally accepted that histamine H2-receptors couple to adenylyl cyclase via the GTP-binding protein Gs (Johnson, 1982; Hill, 1990; Leurs et al., 1995b). Histamine is a potent stimulant of cAMP accumulation in many cell types (Johnson, 1982), particularly those of CNS origin (Daly, 1977). Thus, H2-receptor–mediated effects on cAMP accumulation have been observed in brain slices (Al-Gadi and Hill, 1985; Palacios et al., 1978), gastric mucosa (Soll and Wollin, 1979;Chew et al., 1980; Batzri et al., 1982; Gespach et al., 1982), fat cells (Grund et al., 1975; Keller et al., 1981), cardiac myocytes (Warbanow and Wollenberger, 1979), vascular smooth muscle (Reinhardt and Ritter, 1979), basophils (Lichtenstein and Gillespie, 1975), and neutrophils (Busse and Sosman, 1977). Furthermore, H2-receptor–mediated cAMP accumulation has been demonstrated in CHO cells transfected with the rat, canine, or human H2-receptor cDNA (Gantz et al., 1991a,b; Leurs et al., 1994b; Fukushima et al., 1995). Direct stimulation of adenylyl cyclase activity in cell-free preparations has been detected in both brain and cardiac muscle membranes (Hegstrand et al., 1976; Green et al., 1977; Green and Maayani, 1977; Kanof et al., 1977; Johnson et al., 1979a,b; Kanof and Greengard, 1979a,b; Newton et al., 1982; Olianas et al., 1984). However, caution is required regarding the interpretation of receptor characterization studies using histamine-stimulated adenylyl cyclase activity alone (Hill, 1990). A striking feature of studies of histamine H2-receptor–stimulated adenylyl cyclase activity in membrane preparations is the potent antagonism observed with certain neuroleptics and antidepressants (table8; Spiker et al., 1976; Green et al., 1977; Green and Maayani, 1977; Kanof and Greengard, 1978; Green, 1983). It is notable, however, that most of the neuroleptics and antidepressants are approximately 2 orders of magnitude weaker as antagonists of histamine-stimulated cAMP accumulation in intact cellular systems (table 8; Tuong et al., 1980; Kamba and Richelson, 1983; Hill, 1990). One potential explanation of these differences resides within the buffer systems used for the cell-free adenylyl cyclase assays. Some differences in potency of some antidepressants and neuroleptics have been observed when membrane binding of H2-receptors has been evaluated using [125I]iodoaminopotentidine (table 8; Traiffort et al., 1991). However, invariably the differences observed in the Ki values deduced from ligand binding studies in different buffers are not as large as the differences in KB values obtained from functional studies (table8). For example, in the case of amitriptyline, no difference was observed in binding affinity in Krebs and Tris buffers (Traiffort et al., 1991). In addition to Gs-coupling to adenylyl cyclase, there are reports of H2-receptors coupling to other signaling systems. For example, in gastric parietal cells, H2-receptor stimulation has been shown to increase the intracellular free concentration of calcium ions (Chew, 1985, 1986; Chew and Petropoulos, 1991; Malinowska et al., 1988;Delvalle et al., 1992a). A similar calcium response to histamine H2-receptor stimulation has also been observed in HL-60 cells (Mitsuhashi et al., 1989; Seifert et al., 1992) and in hepatoma-derived cells transfected with the canine H2-receptor cDNA (Delvalle et al., 1992b). In these latter cells, the influence on [Ca2+]i was accompanied by both an increase in inositol trisphosphate accumulation and a stimulation of cAMP accumulation (Delvalle et al., 1992b). Interestingly, the H2-receptor–stimulated calcium and inositol trisphosphate responses in these cells were both inhibited by cholera toxin treatment (but not by pertussis toxin), whereas cholera toxin produced the expected increase in cAMP levels (Delvalle et al., 1992a,b). In single parietal cells, H2-receptors have been shown to release calcium from intracellular calcium stores (Negulescu and Machen, 1988). It should be noted, however, that no effect of H2-agonists was observed on inositol phosphate accumulation or intracellular calcium levels in CHO cells transfected with the human H2-receptor (Leurs et al., 1994a). Thus, the effect of H2-receptor stimulation on intracellular calcium signaling may be very cell-specific. In CHO cells transfected with the rat H2-receptor, H2-receptor stimulation produces both an increase in cAMP accumulation and an inhibition of P2u-receptor–mediated arachidonic acid release (Traiffort et al., 1992b). Interestingly, however, the effect on phospholipase A2 activity (i.e., arachidonic acid release) was not mimicked by forskolin, PGE1, or 8-bromo-cAMP, suggesting a mechanism of activation that is independent of cAMP-mediated protein kinase A activity (Traiffort et al., 1992b). However, in CHO cells transfected with the human H2-receptor, no inhibitory effects of H2-receptor stimulation were observed on phospholipase A2 activity (Leurs et al., 1994b). This observation suggests that these cAMP-independent effects might depend on the level of receptor expression or subtle differences between clonal cell lines. The high apparent affinity of R-(α)-methylhistamine for the histamine H3-receptor has enabled the use of this compound as a radiolabeled probe (Arrang et al., 1987). This compound has been successfully used to identify a single binding site in rat cerebral cortical membranes, which in phosphate buffer has the pharmacological characteristics of theH3-receptor (Arrang et al., 1987, 1990). [3H]R-(α)-methylhistamine binds with high affinity (KD = 0.3 nm) to rat brain membranes, although the binding capacity is generally low (approximately 30 fmol/mg protein; (Arrang et al., 1987). Autoradiographic studies with [3H]R-(α)-methylhistamine have demonstrated the presence of specific thioperamide-inhibitable binding in several rat brain regions, particularly cerebral cortex, striatum, hippocampus, olfactory nucleus, and the bed nuclei of the stria terminalis, which receive ascending histaminergic projections from the magnocellular nuclei of the posterior hypothalamus (Arrang et al., 1987; Pollard et al., 1993). H3-receptors have also been visualized in human brain and the brain of nonhuman primates (Martinez-Mir et al., 1990). H3-receptor binding has been additionally characterized using [3H]R-(α)-methylhistamine in guinea pig cerebral cortical membranes (Kilpatrick and Michel, 1991), guinea pig lung (Arrang et al., 1987), guinea pig intestine, and guinea pig pancreas (Korte et al., 1990). Nα-methylhistamine has also proved successful as a radiolabeled probe for theH3-receptor. Although the relative agonist activity of Nα-methylhistamine (with respect to histamine) is fairly similar for all three histamine receptor subtypes (table 2), the binding affinity of histamine and Nα-methylhistamine for theH3-receptor is several orders of magnitude higher than for either the H1- or H2-receptors (Hill et al., 1977; Ruat et al., 1990b). This ligand can identify high-affinityH3-receptor sites in both guinea pig (Korte et al., 1990) and rat (West et al., 1990; Kathman et al., 1993; Clark and Hill, 1995) brain. The binding of 3H-agonists toH3-receptors in brain tissues has been shown to be regulated by guanine nucleotides, implying a linkage to heterotrimeric G-proteins (Arrang et al., 1987, 1990; Zweig et al., 1992; Clark and Hill, 1995). The binding ofH3-receptor agonists also seems to be sensitive to several cations. Magnesium and sodium ions have been shown to inhibit [3H]R-(α)-methylhistamine binding in rat and guinea pig brain (Kilpatrick and Michel, 1991), and the presence of calcium ions has been reported to reveal heterogeneity of agonist binding (Arrang et al., 1990). The inhibitory effect of sodium ions on agonist binding means that higher Bmaxvalues are usually obtained in sodium-free Tris buffers compared with that in Na/K phosphate buffers (Clark and Hill, 1995). West et al. (1990) have suggested that multiple histamineH3-receptor subtypes exist in rat brain (termed H3A andH3B) on the basis of [3H]Nα-methylhistamine binding in rat cerebral cortical membranes in 50 mm Tris buffer. Under these conditions, the selectiveH3-antagonist thioperamide can discriminate two affinity binding states (West et al., 1990). However, Clark and Hill (1995) have noted that the observed heterogeneity of thioperamide binding is dependent on the concentration of sodium ions or guanine nucleotides within the incubation medium. Thus, in the presence of 100 mm sodium chloride, thioperamide binding conforms to a single binding isotherm (Clark and Hill, 1995). The simplest interpretation of these data is that theH3-receptor can exist in different conformations for which thioperamide, but not agonists or otherH3-antagonists (e.g., clobenpropit), can discriminate. Clark and Hill (1995) have suggested that the equilibrium between these conformations is altered by guanine nucleotides or sodium ions. If this hypothesis is correct, it is likely that the different binding sites represented resting, active, or G-protein–coupled conformations of the H3-receptor. Furthermore, if thioperamide preferentially binds to uncoupled receptors, then this compound should exhibit negative efficacy in functional assays. More recently, radiolabeled H3-receptor antagonists have become available. The first compound to be developed was [125I]iodophenpropit, which has been used to successfully label H3-receptors in rat brain membranes (Jansen et al., 1992). Inhibition curves for thioperamide and iodophenpropit were consistent with interaction with a single binding site, but H3-receptor agonists were able to discriminate high- [4 nm for R-(α)-methylhistamine] and low- [0.2 μm for R-(α)-methylhistamine] affinity binding sites (Jansen et al., 1992). More recently, [3H]GR16820 (Brown et al., 1994) and [125I]iodoproxyfan (Ligneau et al., 1994) have also proved useful as high-affinity radiolabeledH3-antagonists. [125I]iodoproxyfan (Stark et al., 1996a) is the most potent and selective ligand available at the present time with a KD of 65 pm (Ligneau et al., 1994). In rat striatum, in the presence of guanine nucleotides such as guanosine 5′O-(3-thiotriphosphate) (GTPγS), 40% of the binding sites exhibited a 40-fold lower affinity forH3-agonists, providing further evidence for a potential linkage of H3-receptors to G-proteins (Ligneau et al., 1994). [3H]thioperamide and [3H]5-methylthioperamide have also been used to label H3-receptors in rat brain membranes (Alves-Rodrigues et al., 1996; Yanai et al., 1994). However, [3H]thioperamide was shown to bind additionally to low-affinity, high-capacity, nonH3-receptor sites in this tissue (Alves-Rodrigues et al., 1996). In addition to data obtained from ligand binding studies, evidence for the localization of histamine H3-receptors has also come from functional studies, primarily involving inhibition of neurotransmitter release. TheH3-receptor was first characterized as an autoreceptor-regulating histamine synthesis and release from rat cerebral cortex, striatum, and hippocampus (Arrang et al., 1983,1985b,c, 1987a, 1988a,b).H3-receptor–mediated inhibition of histamine release has also been observed in human cerebral cortex (Arrang et al., 1988a). Differences in the distribution ofH3-receptor binding sites and the levels of histidine decarboxylase (an index of histaminergic nerve terminals) suggested at an early stage thatH3-receptors were not confined to histamine-containing neurons within the mammalian CNS (Arrang et al., 1987; Van der Werf and Timmerman, 1989). This has been confirmed by the observations that H3-receptors can regulate serotonergic (Schlicker et al., 1988), noradrenergic (Schlicker et al., 1989, 1992), cholinergic (Clapham and Kilpatrick, 1992), and dopaminergic (Schlicker et al., 1993) neurotransmitter release in mammalian brain. Histamine H3-receptor activation inhibits the firing of the histamine-neurons in the posterior hypothalamus through a mechanism different from autoreceptor functions found on other aminergic nuclei, presumably a block of Ca2+-current (Haas, 1992). Electrophysiological evidence for reduction of excitatory transmitter release (glutamate) has been presented by Brown and Reymann (unpublished data, 1996). Inhibitory effects of H3-receptor activation on neurotransmission have also been documented in the periphery. Thus, H3-receptors have been identified regulating the release of sympathetic neurotransmitters in guinea pig mesenteric artery (Ishikawa and Sperelakis, 1987), human saphenous vein (Molderings et al., 1992), guinea pig atria (Endou et al., 1994; Imamura et al., 1994), and human heart (Imamura et al., 1995). Inhibition of parasympathetic nerve activity has also been observed in guinea pig ileum and human bronchi and trachealis (Trzeciakowski, 1987; Tamura et al., 1988; Ichinose et al., 1989;Ichinose and Barnes, 1989; Hew et al., 1990; Menkveld and Timmerman, 1990; Leurs et al., 1991a,b; Poli et al., 1991). An inhibitory effect of H3-receptor stimulation on release of neuropeptides (tachykinins or calcitonin gene-related peptide) from sensory C fibers has been reported from airways (Ichinose et al., 1990), meninges (Matsubara et al., 1992), skin (Ohkubo and Shibata, 1995), and heart (Imamura et al., 1996). A modulation of acetylcholine, capsaicin, and substance P effects by histamineH3-receptors in isolated perfused rabbit lungs has also been reported (Delaunois et al., 1995). There is evidence that H3-receptor stimulation can inhibit the release of neurotransmitters from nonadrenergic-noncholinergic nerves in guinea pig bronchioles (Burgaud and Oudart, 1994) and ileum (Taylor and Kilpatrick, 1992). Interestingly, in guinea pig ileum, theH3-antagonists betahistine and phenylbutanoylhistamine were much less potent as inhibitors ofH3-mediated effects on nonadrenergic-noncholinergic transmission than they were as antagonists of histamine release in rat cerebral cortex (Taylor and Kilpatrick, 1992). A similar low potency has been observed for these two antagonists for antagonism ofH3-receptor–mediated [3H]acetylcholine release from rat entorhinal cortex (Clapham and Kilpatrick, 1992) and antagonism ofH3-receptor–mediated 5-hydroxytryptamine (5-HT) release from porcine enterochromaffin cells (Schworer et al., 1994). These observations provide support for the possible existence of distinct H3-receptor subtypes, but these responses need to be investigated further to exclude alternative explanations. For example, Arrang et al. (1995) have recently shown that phenylbutanoylhistamine can inhibit [3H]acetylcholine release from rat entorhinal cortex slices and synaptosomes via a nonhistamine receptor mechanism. Thus, the potency of phenylbutanoylhistamine as anH3-receptor antagonist in these preparations may be greatly underestimated because of the additional nonspecific properties of the drug (Arrang et al., 1995). The observed inhibitory effect ofH3-receptor stimulation on 5-HT release from porcine enterochromaffin cells in strips of small intestine (Schworer et al., 1994) provides evidence forH3-receptors regulating secretory mechanisms in nonneuronal cells. This observation suggests thatH3-receptors may also be present in gastric mast cells or enterochromaffin cells and exert an inhibitory influence on histamine release and gastric acid secretion. Consistent with this suggestion, H3-receptor activation has been shown to inhibit gastric acid secretion in conscious dogs (Soldani et al., 1993). An autoregulation of histamine synthesis by histamineH3-receptors has also been reported in isolated rabbit fundic mucosal cells (Hollande et al., 1993). The initial characterization of theH3-receptor made use of the relative high affinity of the agonists Nα-methylhistamine and histamine for the H3-receptor compared with the H1- and H2-receptors together with the H3-antagonist properties of impromidine (H2-agonist), burimamide (H2-antagonist), and betahistine (H1-agonist) (Arrang et al., 1983, 1985a). Since then, several selective ligands (both agonists and antagonists) have been developed that show little effect on H1- and H2-receptors. The first selectiveH3-agonist was R-(α)-methylhistamine (fig. 2), which capitalized on the marked stereoselectivity of agonist binding to the H3-receptor compared with that to the other histamine receptors (Arrang et al., 1985c). Thus, R-(α)-methylhistamine is two orders of magnitude more potent as anH3-agonist than the corresponding S-isomer (table 2). R-α1S-β-dimethylhistamine showed slightly higher potency and even higher selectivity (Lipp et al., 1992). 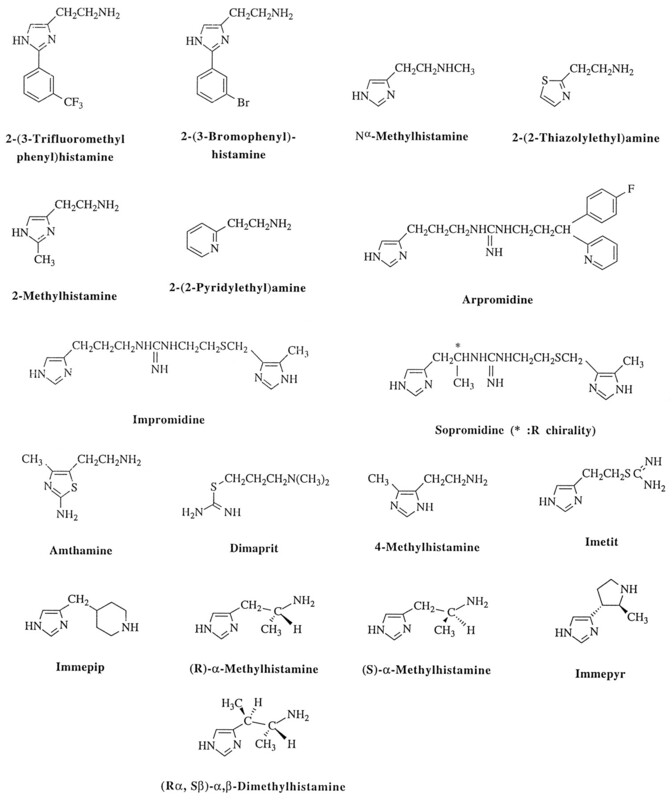 Imetit [S-[2–4(5)-imidazolylethylisothiourea] is a highly selective, full H3-agonist that appears to be more potent than R-(α)-methylhistamine (table 2; Garbarg et al., 1992; Howson et al., 1992; Van der Goot et al., 1992). Both R-(α)-methylhistamine and imetit have been shown to be active in vivo at low doses (Arrang et al., 1987a; Garbarg et al., 1992). Azomethine derivatives of R-(α)-methylhistamine were prepared as lipophilic prodrugs to improve the bioavailability of the hydrophilic drug, particularly its entry into the brain (Krause et al., 1995). Immepip is another potent H3-agonist that has been developed from histamine by extending the alkyl side chain to four methylene groups and incorporating the amino function within a piperidine ring (table 2; Vollinga et al., 1994). Most recently, theH3-agonist potency of a cyclic, conformationally restricted analogue of histamine (immepyr) has been reported (Shih et al., 1995). This compound has been resolved and the (+)-immepyr shown to have an H3-binding affinity (Ki = 2.8 nm) one order of magnitude higher than the corresponding (-)-isomer (Shih et al., 1995). In guinea pig ileum, however, (+)-immepyr was one order of magnitude less potent (pD2 7.1) than R-(α)-methylhistamine (pD2 8.2) as anH3-agonist (Shih et al., 1995). Thioperamide was the first potent and selectiveH3-receptor antagonist to be described (Arrang et al., 1987). This compound appears to act as a competitive antagonist in most functional assays ofH3-receptor activity (Arrang et al., 1987;Hew et al., 1990; Menkveld and Timmerman, 1990), although Clark and Hill (1995) have suggested that it may possess inverse agonist properties. More recently, several other potentH3-antagonists have been described (table3; fig. 7), including clobenpropit (Kathman et al., 1993), iodophenpropit (Jansen et al., 1992), GR175737 (Clitherow et al., 1996), iodoproxyfan (Ligneau et al., 1994; Schlicker et al., 1996), impentamine (Vollinga et al., 1995; Leurs et al., 1996), ethers (Ganellin et al., 1996; Stark et al., 1996a), and carbamates (Stark et al., 1996b). These compounds have initiated some further discussion regarding potentialH3-receptor subtypes. Thus, iodoproxyfan behaves as a partial agonist in both guinea pig ileum and mouse cerebral cortical slices, whereas its noniodinated analogue only exhibits slight agonist activity in the mouse brain preparation (Schlicker et al., 1996). In guinea pig ileum, the noniodinated analogue of iodoproxyfan is a pure antagonist (pA2 7.12; Schlicker et al., 1996). These observations point to differences in receptor structure in the two preparations (perhaps species homologues? ), but they could equally well be accommodated by differences in the efficiency ofH3-receptor–effector coupling between the two tissues. A similar observation has been made with a series of homologues of histamine in which the ethylene side chain was modified (Leurs et al., 1996). Lengthening the side chain of histamine from two to five methylene groups results in the highly selectiveH3-antagonist impentamine, which is equipotent with thioperamide as a competitive antagonist in guinea pig jejunum (table 3; Vollinga et al., 1995). However, in mouse brain cerebral cortical slices, impentamine (like iodoproxyfan) exhibits partial agonist activity (Leurs et al., 1996). At the present time, differences in receptor-effector coupling (and henceH3-receptor reserve) between mouse brain and guinea pig small intestine provide the simplest explanation for these observations. Although many of the H3-selective ligands have been fully characterized in terms of selectivity for each of the three histamine receptors, it is worth stressing that the evaluation ofH3-receptor ligands against other receptor systems is more limited. This needs to be borne in mind, particularly, when considering the in vivo use of these compounds. For example, iodophenpropit (Ki 11 nm) and thioperamide (Ki 120 nm) have both been shown to interact with 5-HT3-receptors (Leurs et al., 1995c), whereas iodoproxyfan did not (Schlicker et al., 1995). Structural information on the histamineH3-receptor is very limited, primarily because of a lack of success in cloning theH3-receptor cDNA. At the present time, there are only two reports of H3-receptor purification studies. Using [3H]histamine as a radioligand, Zweig et al. (1992) have reported the solubilization of anH3-receptor protein from bovine whole brain. Size-exclusion chromatography has revealed an apparent molecular mass of 220 kDa (Zweig et al., 1992). However, because the solubilized receptor retained its guanine nucleotide sensitivity, it is likely that the molecular mass of 220 kDa represents a complex of receptor, G-protein, and digitonin (Zweig et al., 1992). Cherifi et al. (1992)have reported the solubilization (with Triton X-100) and purification of the H3-receptor protein from the human gastric tumoral cell line HGT-1. After gel filtration and sepharose-thioperamide affinity chromatography, protein has been purified with a molecular mass of approximately 70 kDa (Cherifi et al., 1992). However, it remains to be established whether this protein is the histamine H3-receptor. The signal transduction pathways used by the histamineH3-receptor remain largely subject to speculation, but there is increasing evidence to suggest that this receptor belongs to the superfamily of G-protein–coupled receptors. Evidence for this has largely been obtained from ligand-binding studies involving the modulation by guanine nucleotides ofH3-agonist binding (Arrang et al., 1990;West et al., 1990; Kilpatrick and Michel, 1991; Zweig et al., 1992;Clark and Hill, 1995) and of H3-agonist inhibition of 3H-antagonist binding (Jansen et al., 1992, 1994; Ligneau et al., 1994). The most direct evidence for a functional H3-receptor–G-protein linkage has come from studies of [35S]GTPγS binding to rat cerebral cortical membranes (Clark and Hill, 1996). In the presence of H1- and H2-receptor antagonists (0.1 μmmepyramine and 10 μm tiotidine), both R-α-methylhistamine and Nα-methylhistamine produced a concentration-dependent stimulation of [35S]GTPγS binding (EC50 = 0.4 and 0.2 nm, respectively) in rat cerebral cortical membranes (Clark and Hill, 1996). Furthermore, this response was abolished by pretreatment of membranes with pertussis toxin, implying a direct coupling to a Gi or Go protein (Clark and Hill, 1996). Evidence for an involvement of pertussis toxin-sensitive G-proteins in the response to H3-receptor stimulation has also come from studies of histamine H3-receptor signaling in human and guinea pig heart (Endou et al., 1994; Imamura et al., 1995). In these tissues, histamineH3-receptor–stimulation seems to lead to an inhibition of N-type Ca2+ channels responsible for voltage-dependent release of noradrenaline (Endou et al., 1994;Imamura et al., 1995). Very little is known about the intracellular signal transduction pathways initiated by histamine H3-receptor activation. Several research groups have failed to observe an inhibition of adenylyl cyclase activity in different tissues and cells (Garbarg et al., 1989; Schlicker et al., 1991; Cherifi et al., 1992), which might indicate that H3-receptors preferentially couple to Go proteins. There is one interesting report of a negative coupling to phospholipase C in the HGT-1 gastric tumor cell line (Cherifi et al., 1992), but this observation needs confirmation by other research. Studies in hippocampal cell cultures, acutely dissociated neurons, and Xenopus oocytes expressing the recombinant N-methyl-d-aspartate (NMDA) receptor subunits NR2B and NR1 have shown that histamine is able to enhance NMDA-activated currents, independently of the known histamine receptors, via a mechanism that probably involves the polyamine-binding site on the NMDA-receptor complex (Bekkers, 1993; Vorobjev et al., 1993; Williams, 1994;Saysbasili et al., 1995). Histamine and the polyamines spermine and spermidine have also been shown to enhance glutamate toxicity in human NT2-N neurons (Munir et al., 1996). Interestingly, attempts to demonstrate a similar effect of histamine on NMDA-induced currents in rat hippocampal slices, or outside-out patches pulled from the somas of these cells, were without success (Bekkers et al., 1996). However, two studies using conventional and whole cell recording of neurons in the CA1 region of slices of rat hippocampus concluded that the modulation of NMDA-mediated synaptic currents was dependent upon pH (Saysbasili et al., 1995; Janovsky et al., 1995). Thus, at low pH (7.2), histamine enhanced synaptic currents, whereas at pH 7.6 it reduced them. Interestingly, at physiological pH (7.4), no significant action of histamine was seen (Saysbasili et al., 1995). B. A Role as an Intracellular Messenger? Although most actions of histamine can be attributed to an extracellular action, there are reports that histamine may have intracellular actions. The activity of the enzyme, histidine decarboxylase, which catalyzes the formation of histamine from histidine, has been observed to be high in several tissues undergoing rapid growth or repair (Ishikawa et al., 1970; Kahlson and Rosengren, 1971; Watanabe et al., 1981; Bartholeyns and Bouclier, 1984;Bartholeyns and Fozard, 1985). These observations have led to the proposal that newly synthesized (nascent) histamine may have a role in cellular proliferation, perhaps via an intracellular site. Some evidence has been accumulated that intracellular histamine levels (or the activity of histidine decarboxylase) can be regulated by tumor-promoting phorbol esters (Saxena et al., 1989). Furthermore, Brandes and colleagues (Saxena et al., 1989; Brandes et al., 1990,1992) have suggested that N, N-diethyl-2-[4-(phenylmethyl)phenoxy]ethanamine (DPPE) might be an inhibitor of a specific intracellular histamine receptor (HIC). However, at the present time, the evidence in favor of an intracellular histamine receptor has not been generally accepted, and alternative possibilities need to be explored. For example, the direct effects of histamine, or its analogues, on polyamine sites (Vorobjev et al., 1993; Bekkers, 1993) and heterotrimeric G-proteins (Hagelüken et al., 1995; Seifert et al., 1994) could explain many of the observations to date. ↵FNa Address for correspondence: Professor S. J. Hill, Department of Physiology & Pharmacology, Queen’s Medical Centre, Nottingham NG7 2UH, United Kingdom. (1985) The binding of doxepin to histamine H1-receptors in guinea-pig and rat brain. Br. J. Pharmacol. 84:417–424. (1986) Selective displacement of 3H-mepyramine from peripheral vs central nervous system receptors by loratadine, a non-sedative antihistamine. Eur. J. Pharmacol. 127:153–155. (1985) Characterization of histamine receptors mediating the stimulation of cyclic AMP accumulation in rabbit cerebral cortical slices. Br. J. Pharmacol. 85:877–888. (1987) The role of calcium in the cyclic AMP response to histamine in rabbit cerebral cortical slices. Br. J. Pharmacol. 91:213–222. (1996) 3H-Thioperamide as a radioligand for the histamine H3-receptor in rat cerebral cortex. Br. J. Pharmacol. 118:2045–2052. (1993) Characteristics of histamine H1-receptors on HeLa cells. Eur. J. Pharmacol. Mol. Pharmacol. Sect. 245:291–295. (1988a) H3-receptors control histamine release in human brain. J. Neurochem. 51:105–108. (1988b) Phencyclidine blocks histamine H3-receptors in rat brain. Eur. J. Pharmacol. 157:31–39. (1995) Characterization of histamine H3-receptors regulating acetylcholine release in rat entorhinal cortex. Br. J. Pharmacol. 114:1518–1522. (1987a) Highly potent and selective ligands for histamine. H3-receptors. Nature (Lond.) 327:117–123. (1985a) Actions of betahistine at histamine receptors in the brain. Eur. J. Pharmacol. 111:73–84. (1983) Auto-inhibition of brain histamine release mediated by a novel class (H3) of histamine receptor. Nature (Lond.) 302:1–5. (1987b) Autoinhibition of histamine synthesis mediated by presynaptic H3-receptors. Neuroscience 23:149–157. (1985b) Autoregulation of histamine release in brain by pre-synaptic H3-receptors. Neuroscience 15:553–562. (1990) Histamine H3-receptor binding sites in rat brain membranes: modulations by guanine nucleotides and divalent cations. Eur. J. Pharmacol. 188:219–227. (1985c) Stereoselectivity of the histamine H3-presynaptic autoreceptor. Eur. J. Pharmacol. 117:109–114. (1959) Some quantitative uses of drug antagonists. Br. J. Pharmacol. 14:48–58. (1966) Receptors mediating some actions of histamine. Br. J. Pharmacol. 27:427–439. (1949) The action of histamine on hydrochloric acid and pepsin secretion in man. Br. J. Pharmacol. 4:153–161. (1987) Effect of the tachykinin antagonist [d-Pro4, d-Trp7,9,10] substance P-(4-11) on tachykinin- and histamine-induced inositol phosphate generation in intestinal smooth muscle. Naunyn-Schmiedeberg’s Arch. Pharmacol. 335:296–300. (1910) Chemical structure and sympathomimetic action of amines. J. Physiol. (Lond.) 41:19–59. (1984) Involvement of histamine in growth of mouse and rat tumors: antitumoral properties of monofluoromethylhistidine, an enzyme-activated irreversible inhibitor of histidine decarboxylase. Cancer Res. 44:639–645. (1985) Role of histamine in tumor development. Trends Pharmacol. Sci. 6:123–125. (1982) Interaction of histamine with gastric mucosal cells: effect of histamine H2-antagonists on binding and biological response. Mol. Pharmacol. 22:41–47. (1993) Enhancement by histamine of NMDA-mediated synaptic transmission in the hippocampus. Science (Wash. DC) 261:104–106. (1996) Differential effects of histamine on the N-methyl-d-aspartate channel in hippocampal slices and cultures. Neuroscience 72:669–677. (1991) Cloning and structure: function of the H2 histamine receptor. Trends Pharmacol. Sci. 12:9–10. (1989) Nobel lecture: drugs from emasculated hormones—the principle of syntopic antagonism. In Vitro Cell. Dev. Biol. 25:311–320. (1972) Definition and antagonism of histamine H2-receptors. Nature (Lond.) 236:385–390. (1974) Sulphur-methylene isosterism in the development of metiamide, a new histamine H2-receptor antagonist. Nature (Lond.) 248:65–67. (1974) Naming of substituted histamines. Experientia 30:111–113. (1985) The isolated stomach preparation of the mouse: a physiological unit for pharmacological analysis. Br. J. Pharmacol. 86:571–579. (1979) Mechanisms of action of transmitters and other substances on smooth muscle. Physiol. Rev. 59:606–718. (1981) Evidence that histamine and carbachol may open the same ion channels in longitudinal smooth muscle of guinea-pig ileum. J. Physiol. (Lond.) 320:363–379. (1989) Properties of calcium stores and transient outward currents in single smooth muscle cells of rabbit intestine. J. Physiol. (Lond.) 409:385–401. (1987) Histamine affects release and biosynthesis of opioid peptides primarily via H1-receptors in bovine chromaffin cells. J. Neurochem. 49:1688–1696. (1971) Histamine augments leukocyte cyclic AMP and blocks antigenic histamine release. Science 173:743–745. (1988) A detailed mapping of histamine H1-receptors in guinea pig central nervous system established by autoradiography with [125i]iodobolpyramine. Neuroscience 26:553–600. (1950) Introduction to antihistamine agents and antergan derivatives. Ann. N. Y. Acad. Sci. 50:1089–1126. (1936) Action protectrice des éthers phénoliques au cours de l’intoxication histaminique. C. R. Seances Soc. Biol. Fil. 124:547–549. (1979) Ranitidine, a new potent selective H2-receptor antagonist. (Abstract) Br. J. Pharmacol. 66:464P, .0..
(1992) Intracellular histamine and liver regeneration: high affinity binding of histamine to chromatin, low affinity binding to matrix, and depletion of a nuclear storage pool following partial hepatectomy. Biochem. Biophys. Res. Commun. 184:840–847. (1990) Histamine as an intracellular messenger. Biochem. Pharmacol. 40:1677–1681. (1975) Cimetidine: a non-thiourea H2-receptor antagonist. J. Int. Med. Res. 3:86–92. (1981) Radioligand binding studies using 3H-cimetidine and 3H-ranitidine. Br. J. Pharmacol. 72:547P–548P. (1986) Induction of prostacyclin biosynthesis is closely associated with increased guanosine 3′,5′-cyclic monophosphate accumulation in cultured human endothelium. J. Clin. Invest. 78:1253–1260. (1995) Histaminergic modulation of synaptic plasticity in area CA1 of rat hippocampal slices. Neuropharmacology 34:181–190. (1986) Pharmacological studies with SK and F 93944 (temelastine), a novel histamine H1-receptor antagonist with negligible ability to penetrate the central nervous system. Br. J. Pharmacol. 87:569–578. (1995) Characterisation of the specific binding of the histamine H3-receptor antagonist radioligand 3H-GR16820. Br. J. Pharmacol. 114:344P. (1960) Membrane potential changes associated with tachyphylaxis and potentiation of the response to stimulating drugs in smooth muscle. Br. J. Pharmacol. Chemother. 15:611–624. (1995) Tyrosine-hydroxylase phosphorylation in bovine adrenal chromaffin cells: the role of intracellular Ca2+ in the histamine H1-receptor–stimulated phosphorylation of Ser (8), Ser (19), Ser (31) and Ser (40). J. Neurochem. 64:1370–1378. (1994) NG-Nitro-l-arginine methyl ester inhibits the effect of an H3-histaminergic receptor agonist on Nanc contraction in guinea-pig perfused bronchioles. J. Pharm. Pharmacol. 46:153–155. (1978) Histamine H2-receptor binding with 3H-cimetidine in brain. Eur. J. Pharmacol. 50:449–450. (1989) Synthesis and in vitro pharmacology of arpromidine and related phenyl(pyridylalkyl)guanidines, a potential new class of positive inotropic drugs. J. Med. Chem. 32:1963–1970. (1991) Structure-activity relationships of histamine H2-agonists, a new class of positive inotropic drugs. Agents Actions Suppl. 33:231–256. (1992) Synthesis and histamine H2-receptor activity of heterocyclic impromidine analogues. Pharmazie 47:86–91. (1977) Decreased H2 histamine response of granulocytes of asthmatic patients. J. Clin. Invest. 59:1080–1087. (1987) Evidence for low brain penetration by the H1 receptor antagonist temelastine (SK and F 93944). Eur. J. Pharmacol. 133:65–74. (1988) Zolantidine (SKF 95282) is a potent selective brain-penetrating histamine H2-receptor antagonist. Br. J. Pharmacol. 93:69–78. (1988) Regulation of P2y-purinoceptor-mediated prostacyclin release from human endothelial cells by cytoplasmic calcium concentration. Br. J. Pharmacol. 95:1181–1190. (1985) Characterization of histamine H1-receptors on human peripheral lung. Biochem. Pharmacol. 34:3285–3292. Casy, A. F.: Chemistry of anti-H1histamine antagonists. In Handbook of Experimental Pharmacology, ed. by M. Rocha e Silva, vol. 18, part 2, pp. 175–214, Springer-Verlag, Berlin, 1977..
(1983) A comparison of some of the pharmacological properties of etintidine, a new histamine H2-receptor antagonist, with those of cimetidine, ranitidine. J. Pharmacol. Exp. Ther. 224:171–179. (1979a) Characteristics of histamine H1-receptors in peripheral tissues labelled with 3H-mepyramine. J. Pharmacol. Exp. Ther. 209:437–442. (1979b) Heterogeneity of histamine H1-receptors: species variations in [3H] mepyramine binding of brain membranes. J. Neurochem. 32:1653–1663. (1992) Purification of histamine H3 receptor negatively coupled to phosphoinositide turnover in the human gastric cell line HGT1. J. Biol. Chem. 267:25315–25320. (1986) Cholecystokinin, carbachol, gastrin, histamine and forskolin increase [Ca2+]i in gastric glands. Am. J. Physiol. 250:G814–G823. (1985) Differential effects of extracellular calcium removal and non-specific effects of Ca2+ antagonists on acid secretory activity in isolated gastric glands. Biochim. Biophys. Acta 846:370–378. (1980) Histamine responsiveness of isolated gastric glands. Am. J. Physiol. 238:G312–G320. (1991) Thapsigargin potentiates histamine-stimulated HCl secretion in gastric parietal cells but does not mimic cholinergic responses. Cell Regul. 2:27–39. (1989) Endogenous histamine excites neurones in the guinea pig superior cervical ganglion in vitro. J. Physiol. 409:297–312. (1992) Histamine H3 receptors modulate the release of [3H]-acetylcholine from slices of rat entorhinal cortex: evidence for the possible existence of H3 receptor subtypes. Br. J. Pharmacol. 107:919–923. (1995) Differential effect of sodium ions and guanine nucleotides on the binding of thioperamide and clobenpropit to histamine H3-receptors in rat cerebral cortical membranes. Br. J. Pharmacol. 114:357–362. (1996) Sensitivity of histamine H3 receptor agonist-stimulated [35S]-GTPγS binding to pertussis toxin. Eur. J. Pharmacol. 296:223–225. (1992) High affinity histamine H3 receptors regulate ACTH release by AtT-20 cells. Eur. J. Pharmacol. 210:31–35. (1987) Histamine-stimulated phosphoinositide hydrolysis in developing rat brain. Mol. Pharmacol. 32:384–390. (1996) Novel 1,2,4-oxadiazoles as potent and selective histamine H3-receptor antagonists. Bioorg. & Med. Chem. Lett. 6:833–838. (1985) The acute effects of acrivastine (BW 825 C), a new antihistamine, compared with triprolidine on measures of central nervous system performance and subjective effects. Clin. Pharmacol. Ther. 38:381–386. (1990) Histamine receptors. in Comprehensive Medicinal Chemistry, ed Emmett J. C. (Pergamon Press, Oxford), 3:323–421. (1910) The physiological action of β-imidazolylethylamine. J. Physiol. (Lond.) 41:318–344. (1977) Cyclic nucleotides in the nervous system. (Raven, New York). Luyten W. H. M. L.
(1993) Genomic cloning, heterologous expression and pharmacological characterization of a human histamine H1-receptor. Biochem. Biophys. Res. Commun. 197:1601–1608. (1995) Modulation of acetylcholine, capsaicin and substance P effects by histamine H3 receptors in isolated perfused rabbit lungs. Eur. J. Pharmacol. 277:243–250. (1995) Construction of a novel bifunctional biogenic amine receptor via 2 point mutations of the H2-histamine receptor. Mol. Med. 1:280–286. (1992a) Regulation of [Ca2+]i by secretagogue stimulation of canine gastric parietal cells. Am. J. Physiol. 262:G420–G426. (1992b) Characterization of H2 histamine receptor: linkage to both adenylate cyclase and [Ca2+]i signaling systems. Am. J. Physiol. 263:G967–G972. (1992) Histamine H1-receptor-mediated calcium influx in DDT1 MF-2 cells. Biochem. J. 284:425–431. (1994) Characteristics of 3H-mepyramine binding in DDT1 MF2 cells: evidence for high binding to a functional histamine H1 receptor. Eur. J. Pharmacol. Mol. Pharmacol. Sect. 268:257–262. (1989) Temporal changes in the calcium dependence of the histamine H1-receptor-stimulation of the cyclic AMP accumulation in guinea-pig cerebral cortex. Br. J. Pharmacol. 98:1365–1375. (1985) Histamine-induced inositol phospholipid breakdown in the longitudinal smooth muscle of guinea-pig ileum. Br. J. Pharmacol. 85:499–512. (1986a) Enhancement of histamine H1-receptor agonist activity by 1,4-dithiothreitol in guinea-pig cerebellum and cerebral cortex. J. Neurochem. 47:1476–1482. (1986b) Histamine-induced hydrolysis of polyphosphoinositides in guinea-pig ileum and brain. Eur. J. Pharmacol. 124:255–265. (1986c) Selective enhancement of histamine H1-receptor responses in guinea-pig ileal smooth muscle by 1,4-dithiothreitol. Br. J. Pharmacol. 87:191–199. (1988) Kinetic studies on the mechanism by which histamine H1 receptors potentiate cyclic AMP accumulation in guinea-pig cerebral cortical slices. Mol. Pharmacol. 33:626–633. (1984) Imidazolylphenyl formamidines: a structurally novel class of potent histamine H2-receptor antagonists. J. Med. Chem. 27:380–386. (1980) Cyclic nucleotides and contraction/relaxation in airway muscle: H1 and H2 agonists and antagonists. J. Pharmacol. Exp. Ther. 215:434–442. 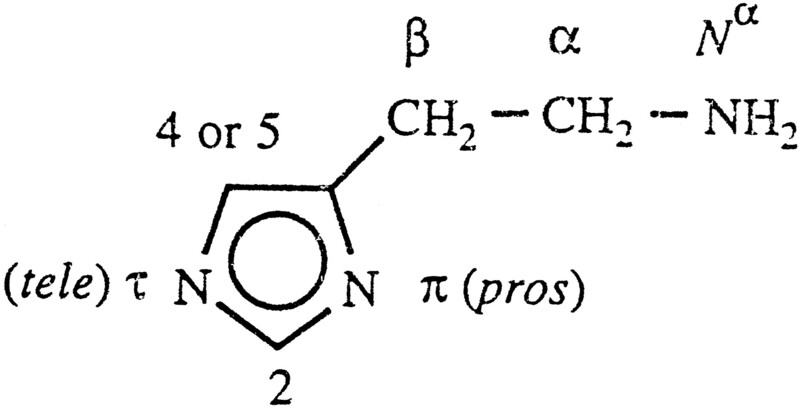 (1977) Dimaprit, [S-3-(n, N-dimethylamino)propylisothiourea], a highly specific histamine H2-receptor agonist: part 2. Agents Actions 7:39–43. (1978) Impromidine (SKandF 92676) is a very potent and specific agonist for histamine H2-receptors. Nature (Lond.) 276:403–405. (1988) A highly potent and selective H3 agonist relaxes rabbit middle cerebral artery, in vitro. Eur. J. Pharmacol. 150:393–396. (1992) Endothelium-dependent relaxation of rabbit middle cerebral artery to a histamine H3-agonist is reduced by inhibitors of nitric oxide and prostacyclin synthesis. Br. J. Pharmacol. 105:103–106. (1983) Characterization of histamine receptors in cat cerebral arteries in vitro and in situ. J. Pharmacol. Exp. Ther. 225:168–175. (1989) Histamine analogues: 32nd communication—synthesis and pharmacology of sopromidine, a potent and stereoselective isomer of the achiral H2-agonist impromidine. Eur. J. Med. Chem. 24:259–262. (1949) Effects of antihistamine compounds on the adrenaline liberation from supra renals. Acta Physiol. Scand. 17:345–355. (1994) Histamine H3-receptor signalling in the heart: possible involvement of Gi/Go proteins and N-type Ca2+ channels. J. Pharmacol. Exp. Ther. 269:221–229. (1992) Histamine H2-receptor agonists: Synthesis, in vitro pharmacology, and qualitative structure-activity relationships of substituted 4-and 5-(2-aminoethyl)thiazoles. J. Med. Chem. 35:3239–3246. (1982) Histamine receptor mechanism of the lung. in Pharmacology of Histamine Receptors, eds Ganellin C. R., Parsons M. E. (Wright, Bristol, England), pp 298–322. (1979) Tricyclic antidepressants: potent blockade of histamine H1 receptors of guinea pig ileum. Eur. J. Pharmacol. 58:479–483. (1948) Observations on reactive hyperaemia as related to histamine, on drugs antagonising vasodilation induced by histamine and on vasodilator properties of adenosine triphosphate. Acta. Physiol. Scand. 15:264–278. (1985a) The binding of 3H-tiotidine to homogenates of guinea-pig lung parenchyma. Br. J. Pharmacol. 86:475–482. (1985b) A study of the histamine H2-receptor mediating relaxation of the parenchymal lung strip preparation of the guinea-pig. Br. J. Pharmacol. 86:465–473. (1993) Genomic cloning of the rat histamine H1 receptor. Biochem. Biophys. Res. Commun. 190:294–301. (1994) Molecular cloning of the human H1-receptor gene. Biochem. Biophys. Res. Commun. 201:894–901. (1990) Purification of 3H-mepyramine receptor from rat liver and its amino acid sequence homology with debrisoquine-4-hydroxylase cytochrome P-450. Eur. J. Pharmacol. 183:1727–1738. (1995) Structural and functional analysis of the canine histamine H2-receptor by site-directed mutagenesis: N-glycosylation is not vital for its action. Biochem. J. 310:553–558. (1983) Specific binding of [3H]-tiotidine to histamine H2-receptors in guinea pig cerebral cortex. Nature (Lond.) 304:65–67. (1982) Chemistry and structure-activity relationships of drugs acting at histamine receptors. in Pharmacology of Histamine Receptors, eds Ganellin C. R., Parsons M. E. (Wright, Bristol, England), pp 10–102. (1992) Pharmacochemistry of H1 and H2 receptors. in The Histamine Receptor, eds Schwartz J. C., Haas H. (Wiley-Liss, New York), pp 1–56. (1978) Selectivity and the design of histamine H2-receptor antagonists. J. Appl. Chem. Biotechnol. 28:183–200. (1996) A novel series of (Phenoxyalkyl) imidazoles as potent H3-receptor histamine antagonists. J. Med. Chem. 39:3806–3813. (1995) Design of potent non-thiourea H3-receptor histamine antagonists. J. Med. Chem. 38:3342–3350. (1992) Molecular basis for the interaction of histamine with the histamine-H2 receptor. J. Biol. Chem. 267:20840–20843. (1991a) Molecular cloning of the human histamine H2 receptor. Biochem. Biophys. Res. Commun. 178:1386–1392. (1991b) Molecular cloning of a gene encoding the histamine H2 receptor. Proc. Natl. Acad. Sci. USA 88:429–433. (1992) S-[2-(4-imidazolyl)ethyl]isothiourea, a highly specific and potent histamine H3-receptor agonist. J. Pharmacol. Exp. Ther. 263:304–310. (1988) Synergism between histamine H1- and H2-receptors in the cyclic AMP response in guinea-pig brain slices: effect of phorbol esters and calcium. Mol. Pharmacol. 33:38–43. (1989) Effect of histamine H3-receptor ligands on various biochemical indices of histaminergic neuron activity in rat brain. Eur. J. Pharmacol. 164:1–11. (1988) Adenosine promotes histamine H1-mediated negative chronotropic and inotropic effects on human atrial myocardium. J. Pharmacol. Exp. Ther. 247:844–849. (1990) Excitation of brain stem neurones by noradrenaline and histamine. J. Basic Clin. Physiol. Pharmacol. 1:71–76. (1982) Histamine interaction on surface recognition sites of H2-type in parietal and non-parietal cells isolated from guinea-pig stomach. FEBS Lett. 149:85–90. (1983) Histamine receptors in brain. Handb. Psychopharmacol. 17:385–420. (1977) Antagonism of histamine-activated adenylate cyclase in brain by d-lysergic acid diethylamide. Proc. Natl. Acad. Sci. USA 74:5697–5701. (1987) Nomenclature, classification and notation of receptors: 5-hydroxytryptamine receptors and binding sites as examples. in Perspectives on Receptor Classification: Receptor Biochemistry and Methodology, eds Black J. W., Jenkinson D. H., Gerskowitch V. P. (Wiley-Liss, New York), 6:237–267. (1977) Tricyclic antidepressant drugs block histamine H2 receptor in brain. Nature (Lond.) 260:163–165. (1989) Histamine action on dentate granule cells of the rat in vitro. Neuroscience 34:299–303. (1986) Contractile elements in endothelial cells as potential targets for drug action. Trends Pharmacol. Sci. 7:452–457. (1984) Inhibition of T suppressor cell expression by histamine type 2 (H2) receptor antagonists. J. Immunol. 132:3054–3057. (1981) Cerebral circulation and histamine: 1—participation of vascular H1- and H2-receptors in vasodilatory responses to carotid arterial infusion. J. Cereb. Blood Flow Metab. 1:97–108. (1975) Histamine receptors in adipose tissue: involvement of cyclic adenosine monophosphate and the H2-receptor in the lipolytic response to histamine in isolated canine fat cells. J. Pharmacol. Exp. Ther. 195:176–184. (1984) Inotropic effects of histamine in human myocardium: differentiation between positive and negative components. J. Cardiovasc. Pharmacol. 6:1210–1215. (1992) Electrophysiology of histamine receptors. in The Histamine Receptor: Receptor Biochemistry and Methodology, eds Schwartz J. C., Haas H. L. (Wiley-Liss, New York), 16:161–177. (1981) Histamine hyperpolarizes hippocampal neurones in vitro. Neurosci. Lett. 22:75–78. (1975) Histamine H2-receptors on single central neurones. Nature 255:634–635. (1986) Effects of histamine on hippocampal pyramidal cells of the rat in vitro. Exp. Brain Res. 62:123–130. (1988) LTP in slices from human hippocampus. in Synaptic Plasticity in the Hippocampus, eds Haas H. L., Buzsaki G. (Springer, Berlin), pp 77–80. (1983) Histamine and noradrenaline decrease calcium-activated potassium conductance in hippocampal pyramidal cells. Nature (Lond.) 302:432–434. (1977) Central actions of histamine, microelectrophoretic studies. Brain Res. 122:269–279. (1975) Histamine: action on supraoptic and other hypothalamic neurones of the cat. Brain Res. 88:166–170. (1978) Hypersensitivity to histamine in the guinea pig brain: microiontophoretic and biochemical studies. Brain Res. 156:275–291. (1983) The nature of the binding of 3H-mepyramine to homogenates of guinea-pig cerebral cortex at different 3H-ligand concentrations. Biochem. Pharmacol. 32:2449–2451. (1995) Histamine receptor-dependent and/or receptor independent activation of guanine nucleotide binding proteins by histamine and γ-substituted histamine derivatives in human leukemia (HL-60) and human erythroleukemia (HEL) cells. Biochem. Pharmacol. 49:901–914. (1988) β2-adrenoceptor stimulation inhibits histamine-stimulated inositol phospholipid hydrolysis in bovine tracheal smooth muscle. Br. J. Pharmacol. 95:1204–1212. (1987) Changes in cytosolic Ca2+ associated with von Willebrand factor release in human endothelial cells exposed to histamine: study of microcarrier cell monolayers using the fluorescent probe indo-1. J. Clin. Invest. 79:600–608. (1983) Effects of mechanical performance and biochemical and electrical activity in the heart of monkeys (Mocaca fuscata). Eur. J. Pharmacol. 91:11–19. (1984) Adenosine selectively attenuates H2- and beta-mediated cardiac responses to histamine and norepinephrine: an unmasking of H1- and alpha-mediated responses. J. Pharmacol. Exp. Ther. 231:215–233. (1990) Inotropic, electrophysiological and biochemical responses in rabbit papillary muscles: evidence for co-existence of H1- and H2-receptors. J. Pharmacol. Exp. Ther. 253:250–256. (1988a) Effects of Ca2+ channel antagonists and ryanodine on H1-receptor mediated electromechanical response to histamine in guinea-pig left atria. Naunyn-Schmiedeberg’s Arch. Pharmacol. 337:323–330. (1988b) Differential effects of histamine mediated H1- and H2-receptors on contractility, spontaneous rate and cyclic nucleotides in the rabbit heart. Eur. J. Pharmacol. 153:221–229. (1976) Histamine-sensitive adenylate cyclase in mammalian brain. Nature (Lond.) 260:163–165. (1987) On the mechanism of histamine induced enhancement of the cardiac Ca2+ current. Pflügers Arch. 410:23–29. (1990) Characterization of histamine H3-receptors in guinea pig ileum with H3-selective ligands. Br. J. Pharmacol. 101:621–624. (1990) Distribution, properties and functional characteristics of three classes of histamine receptor. Pharmacol. Rev. 42:45–83. (1987) Histamine receptors in the mammalian central nervous system: biochemical studies. Prog. Med. Chem. 24:29–84. (1981) Affinities of histamine H1-antagonists in guinea-pig brain: similarity of values determined from 3H-mepyramine binding and from inhibition of a functional response. J. Neurochem. 37:1357–1360. (1992) The H1-receptor and inositol phospholipid hydrolysis. in The Histamine Receptor, eds Schwartz J.-C., Haas H. L. (Wiley-Liss, New York), pp 109–128. (1981) Characterization of 3H-mepyramine binding to the longitudinal muscle of guinea-pig small intestine. Mol. Pharmacol. 19:379–387. (1980) Histamine H1-receptors in the brain of the guinea-pig and the rat: differences in ligand binding properties and regional distribution. Br. J. Pharmacol. 68:687–696. (1977) Specific binding of 3H-mepyramine to histamine H1-receptors in intestinal smooth muscle. Nature (Lond.) 270:361–363. (1992) Iodoaminopotentidine and related compounds: a new class of ligands with high affinity and selectivity for the histamine H2 receptor. J. Med. Chem. 35:2231–2238. (1993) Autoregulation of histamine synthesis through H3 receptors in isolated fundic mucosal cells. Am. J. Physiol. 265:G1039–G1044. (1993) Molecular cloning of the guinea-pig histamine H1-receptor gene. J. Biochem. 114:408–414. (1992) Two novel and potent and selective histamine H3-receptor agonists. Bioorg. Med. Chem. Lett. 2:77–79. (1989) Histamine H3-receptors modulate nonadrenergic noncholinergic neural bronchoconstriction in guinea-pig in vivo. Eur. J. Pharmacol. 174:49–55. (1990) Histamine H3-receptors inhibit neurogenic microvascular leakage in airways. J. Appl. Physiol. 68:21–25. (1989) Histamine H3-receptors inhibit cholinergic neurotransmission in guinea-pig airways. Br. J. Pharmacol. 97:13–15. (1994) Unmasking of activated histamine H3-receptors in myocardial ischemia: their role as regulators of exocytotic norepinephrine release. J. Pharmacol. Exp. Ther. 271:1259–1266. (1995) Functional identification of histamine H3-receptors in the human heart. Circ. Res. 77:206–210. (1996) Histamine H3-receptor-mediated inhibition of calcitonin gene-related peptide release from cardiac C fibers: a regulatory negative feedback loop. Circ. Res. 78:863–869. (1996) Characteristics of the mouse genomic histamine H1-receptor gene. Genomics 36:178–181. (1976) Restoration by histamine of the calcium-dependent electrical and mechanical response in the guinea-pig papillary muscle partially depolarized by potassium. Naunyn-Schmiedeberg’s Arch. Pharmacol. 294:261–269. (1993) High stable expression of the bovine histamine H1-receptor coupled to [Ca2+]i mobilization in Cho-K1 cells. Biochem. Biophys. Res. Commun. 195:1294–1300. (1970) Induction of histidine decarboxylase in tumor-bearing fat. Biochem. 68:347–355. (1987) A novel class (H3) of histamine receptors on perivascular nerve terminals. Nature (Lond.) 327:158–160. (1973) The binding of conformationally restricted antihistamines to histamine receptors. J. Pharm. Pharmacol. 25:887–894. (1995) Histamine activated currents in the olfactory bulb. Naunyn-Schmiedeberg’s Arch. Pharmacol. 352:386–393. (1995) pH-dependent enhancement of synaptic transmission by histamine in the mouse hippocampus. Eur. J. Neurosci. 7:2017–2020. (1992) The first radiolabeled histamine H3 receptor antagonist, [125i]iodophenpropit: saturable and reversible binding to rat cortex membranes. Eur. J. Pharmacol. 217:203–205. (1994) Characterization of the binding of the first selective radiolabeled histamine H3-receptor antagonist, 125I-iodophenpropit, to rat brain. Br. J. Pharmacol. 113:355–362. (1987) Heinz Schild’s contribution to receptor classification. in Perspectives on Receptor Classification, Receptor Biochemistry and Methodology, eds Black J. W., Jenkinson D. H., Gerskowitch V. P. (Wiley-Liss, New York), 6:1–10. (1982) Histamine receptors and cyclic nucleotides. in Pharmacology of Histamine Receptors, eds Ganellin R., Parsons M. (Wright, Bristol, England), pp 146–216. (1979a) Studies on histamine H2 receptors coupled to cardiac adenylate cyclase: blockade by H2 and H1 receptor antagonists. Mol. Pharmacol. 16:417–428. (1979b) Studies on histamine H2 receptors coupled to cardiac adenylate cyclase: effects of guanylnucleotides and structural requirements of agonist activity. Biochim. Biophys. Acta. 587:155–168. (1971) Biogenesis and Physiology of Histamine (Edward Arnold Ltd. London). (1983) Antidepressants are weak competitive antagonists of histamine H2-receptors in dissociated brain tissue. Eur. J. Pharmacol. 94:313–318. (1984) Histamine H1-receptors in human brain labelled with [3H] doxepin. Brain Res. 304:1–7. (1978) Brain histamine receptors as targets for antidepressant drugs. Nature (Lond.) 272:329–333. (1979a) Pharmacological properties of histamine-sensitive adenylate cyclase from guinea-pig cardiac ventricular muscle. Mol. Pharmacol. 15:445–461. (1979b) Pharmacological properties of histamine-sensitive adenylate cyclase from mammalian brain. J. Pharmacol. Exp. Ther. 209:87–96. (1977) Biochemical characterization of histamine-sensitive adenylate cyclase in mammalian brain. Arch. Biochem. Biophys. 182:321–334. (1993) Nordimaprit, homodimaprit, clobenpropit and imetit: affinities for H3 binding sites and potencies in a functional H3 receptor model. Naunyn-Schmiedeberg’s Arch. Pharmacol. 348:498–503. (1981) Impromidine stimulated adenylate cyclase activity in canine fat cell ghosts. (Abstract) Pharmacologist 23:186. (1980) Properties of 3H-cimetidine binding in rat brain membrane fractions. Life Sci. 26:1293–1302. (1986) The effects of derivatives of histamine on natural suppressor cells. J. Immunol. 137:308–314. (1985) Pharmacological effects of autacoids on subsets of T cells: regulation of expression/function of histamine-2 receptors by a subset of suppressor cells. J. Clin. Invest. 75:1578–1583. (1990) Histamine excites pedunculopontine neurones in guinea pig brainstem slices. Neurosci. Lett. 112:257–262. (1986) Increased permeability of microcarrier-cultured endothelial monolayers in response to histamine and thrombin. Am. J. Pathol. 122:50–61. (1991) Characterisation of the binding of the histamine H3-receptor agonist [3H](r)-α-methyhistamine to homogenates of rat and guinea-pig cortex. Agents Actions 33:69–75. (1996) Regulation of [Ca2+]i rise activated by doxepin-sensitive H1-histamine receptors in jurkat cells, cloned human T lymphocytes. Gen. Pharmacol. 27:289–291. 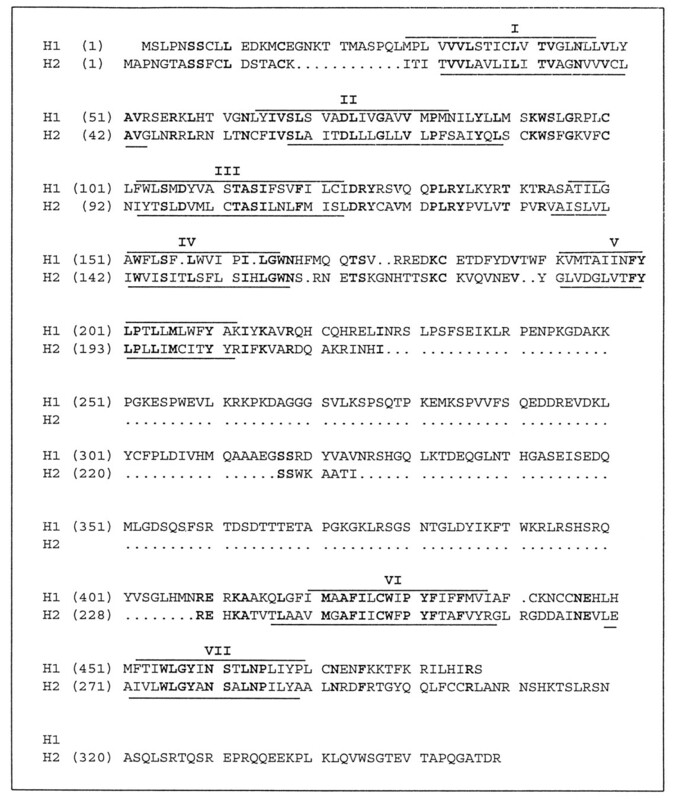 (1988) Multiple regulation of proenkephalin gene expression by protein kinase C. J. Biol. Chem. 263:2003–2008. (1996) Cloning, RNA expression and chromosomal location of a mouse histamine H2-receptor gene. Genomics 37:390–394. (1986) [125i]Iodobolpyramine, a highly selective probe for histamine H1-receptors in guinea pig brain. Eur. J. Pharmacol. 120:151–160. (1990) Characterization and tissue distribution of H3-receptors in guinea-pigs by Nα-methylhistamine. Biochem. Biophys. Res. Commun. 168:979–986. (1988) Membrane properties, response to amines and to tetanic stimulation of hippocampal neurons in the genetically epileptic mutant mouse tottering. Exp. Brain Res. 72:45–50. (1987) Histamine-induced calcium release and phorbol antagonism in cultured airway smooth muscle cells. Am. J. Physiol. 253:C561–C566. (1995) Synthesis, X-ray crystallography, and pharmacokinetics of novel azomethine prodrugs of (R)-α-methylhistamine: highly potent and selective histamine H3 receptor agonists. J. Med. Chem. 38:4070–4079. (1982) In vitro and in vivo binding characteristics of a new long-acting histamine H1-antagonist, astemizole. Mol. Pharmacol. 21:294–300. (1994) Chromosomal localization of the human histamine H1-receptor gene. Hum. Genom. 94:186–188. (1983) BW 825C: a potent antihistamine with low sedation potential. (Abstract) Pharmacologist 25:163. (1995) Synthesis and histamine H1-receptor agonist activity of a series of 2-phenylhistamines, 2-heteroaryl histamines and analogues. J. Med. Chem. 38:1287–1294. (1977) Histamine-induced inhibition of normal human basophil chemotaxis to C5a. J. Immunol. 118:815–818. (1991a) Histamine H1-receptor mediated cyclic GMP production in guinea-pig lung tissue is an l-arginine-dependent process. Biochem. Pharmacol. 42:271–277. (1991b) Effects of histamine H1-, H2- and H3-receptor selective drugs on the mechanical activity of guinea-pig small and large intestine. Br. J. Pharmacol. 102:179–185. (1996) Histamine homologues discriminating between two functional H3 receptor assays: evidence for H3 receptor heterogeneity? J. Pharmacol. Exp. Ther. 276:1009–1015. (1995a) Lysine200 located in the fifth transmembrane domain of the histamine H1-receptor interacts with histamine but not with all H1 agonists. Biochem. Biophys. Res. Commun. 214:110–117. (1994b) Pharmacological characterization of the human histamine H2-receptor stably expressed in Chinese hamster ovary cells. Br. J. Pharmacol. 112:847–854. (1994a) Site-directed mutagenesis of the histamine H1-receptor reveals a selective interaction of asparagine207 with subclasses of H1-receptor agonists. Biochem. Biophys. Res. Commun. 201:295–301. (1995b) Molecular pharmacological aspects of histamine receptors. Pharmacol. Ther. 66:413–463. (1994c) Guinea-pig histamine H1 receptor: II—stable expression in Chinese hamster ovary cells reveals the interaction with three major signal transduction pathways. J. Neurochem. 62:519–527. (1995c) Evaluation of the receptor selectivity of the H3 receptor antagonists, iodophenpropit and thioperamide: an interaction with the 5-HT3 receptor revealed. Br. J. Pharmacol. 116:2315–2321. (1988) Histamine modulates calcium current in guinea-pig ventricular myocytes. J. Pharmacol. Exp. Ther. 246:377–383. (1982) Action of histamine on the heart and vasculature. in Pharmacology of Histamine Receptors, eds Ganellin R., Parsons M. (Wright, Bristol, England), pp 236–297. (1975) The effect of the H1- and H2-antihistamines on “allergic” histamine release and its inhibition by histamine. J. Pharmacol. Exp. Ther. 192:441–450. (1994) 125I-Iodoproxyfan, a new antagonist to label and visualize cerebal histamine H3-receptors. J. Pharmacol. Exp. Ther. 271:452–459. (1986) Actions of nizatidine on the rat uterus, dog stomach and experimentally induced gastric lesions. J. Pharmacol. Exp. Ther. 239:400–405. (1992) Synthesis, absolute configuration, stereoselectivity, and receptor selectivity of (αR, βS)-α, β-dimethylhistamine: a novel highly potent histamine H3 receptor agonist. J. Med. Chem. 35:4434–4441. (1992) Re-examination of 3H-mepyramine binding assay for histamine H1-receptor using quinine. Biochem. Biophys. Res. Commun. 189:378–384. (1986) Effects of opioid peptides and morphine on histamine-induced catecholamine secretion from cultured, bovine adrenal chromaffin cells. Br. J. Pharmacol. 89:327–334. (1947) Pharmacology of antihistamine compounds. Physiol. Rev. 27:542–573. (1982) Response of the histamine H2-receptor in the brain to antidepressant drugs. in Typical and Atypical Antidepressants: Molecular Mechanisms, eds Costa E., Racagni G. (Raven Press, New York), pp 133–167. (1985) Norepinephrine and histamine potentiate the increase in adenosine 3′,5′-monophosphate elicited by vasoactive intestinal polypeptide in mouse cerebral cortical slices: mediation by α1-adrenergic and H1-histaminergic receptors. J. Neurochem. 35:362–368. (1961) Studies on inflammation: I—the effect of histamine and serotonin on vascular permeability: an electron microscopy study. J. Biophys. Cytol. 11:571–606. (1968) Endothelium contraction induced by histamine-type mediators: an electron microscope study. J. Cell. Biol. 42:647–652. (1988) Gastric H+ secretion: histamine (cAMP-mediated) activation of protein phosphorylation. Biochim. Biophys. Acta 972:95–109. (1991) Histamine-induced increases in cyclic AMP levels in bovine adrenal medullary cells. Br. J. Pharmacol. 104:839–846. (1955) Some chemical and physical properties associated with histamine antagonism. Br. J. Pharmacol. 10:270–278. (1990) Three histamine receptors (H1, H2 and H3) visualized in the brain of human and non-human primates. Brain Res. 526:322–327. (1992) UK 14,304, R(-)-α-methylhistamine, and Sms 201–995 block plasma protein leakage within dura mater by prejunctional mechanisms. Eur. J. Pharmacol. 225:145–150. (1986) Histamine activates H1-receptors to induce cytosolic free calcium transients in cultured vascular smooth muscle cells from rat aorta. Biochem. Biophys. Res. Commun. 135:172–177. (1991) Modulation of neuronal firing mode in cat and guinea pig LGNd by histamine: possible cellular mechanism of histaminergic control of arousal. J. Neurosci. 11:3188–3199. (1985) Cultured endothelial cells synthesize both platelet-activating factor and prostacyclin in response to histamine, bradykinin and adenosine triphosphate. J. Clin. Invest. 76:271–280. (1995) Synergy between the inositol phosphate responses to transfected human adenosine A1-receptors and constitutive P2-purinoceptors in CHO-K1 cells. Br. J. Pharmacol. 115:1415–1424. (1974) Hemolytic plaque formations by leukocytes in vitro. J. Clin. Invest. 53:13–21. (1987) Histamine and its lymphocyte-selective derivatives as immune modulators. Trends Pharmacol. Sci. 8:437–441. (1981) Autacoids as modulators of the inflammatory and immune response. Am. J. Med. 71:100–106. (1990) Inhibition of electrically evoked contractions of guinea pig ileum preparations mediated by the histamine H3 receptor. Eur. J. Pharmacol. 186:343–347. (1983) Increased permeability associated with dilation of endothelial cell junctions caused by histamine in intimal explants from bovine pulmonary artery. Exp. Lung Res. 6:11–25, .8..
(1989) Multiple signalling pathways of histamine H2 receptors: identification of an H2 receptor dependent Ca2+ mobilization pathway in human HL-60 promyelocytic leukemia cells. J. Biol. Chem. 264:18356–18362. (1988) Characterization of functional histamine H1-receptors on a cultured smooth muscle cell line. J. Cell Physiol. 134:367–375. (1994) Stable expression of human H1-histamine-receptor cDNA in Chinese hamster ovary cells: pharmacological characterization of the protein, tissue distribution of messenger RNA and chromosomal localisation of the gene. Eur. J. Biochem. 224:489–495. (1995) Pharmacological and functional characterization of the wild-type and site-directed mutants of the human H1-histamine receptor stably expressed in CHO cells. J. Recept. Signal Transduction Res. 15:91–102. (1992) Inhibition of noradrenaline release from the sympathetic nerves of the human saphenous vein by presynaptic histamine H3-receptors. Naunyn-Schmiedeberg’s Arch. Pharmacol. 346:46–50. (1987) Histamine-operated calcium channels in intestinal smooth muscle of the guinea-pig. Eur. J. Pharmacol. 135:69–75. (1990) Cardiohistaminergics: new developments in histamine H2-agonists. Drugs Future 15:919–933. (1996) Pharmacological and immunological characterization of N-methyl-d-aspartate receptors in human NT2-N neurones. J. Pharmacol. Exp. Ther. 276:819–828. (1990) Histamine-stimulated and GTP-binding protein-mediated phospholipase A2 activation in rabbit platelets. J. Biol. Chem. 265:4290–4295. (1988) Intracellular Ca regulation during secretagogue stimulation of the parietal cell. Am. J. Physiol. 254:C130–C140. (1982) Histamine-sensitive adenylate cyclase in monkey brain. Brain Res. 239:639–643. (1991) Sedation and histamine H1-receptor antagonism: studies in man with the enantiomers of chlorpheniramine and dimethindene. Br. J. Pharmacol. 104:270–276. (1982) The in vivo pharmacological profile of histamine (H1) antagonists in the rat. Drug Dev. Res. 2:559–566. (1988) H1-histaminergic activation of catecholamine release by chromaffin cells. Biochem. Pharmacol. 37:221–228. (1984) Histamine H2-binding studies in the guinea-pig brain. Agents Actions 14:543–545. (1995) ATP-sensitive K+ channels mediate regulation of substance P release via the prejunctional histamine H3-receptor. Eur. J. Pharmacol. 277:45–49. (1994) Site-directed mutagenesis of the histamine H1-receptor: roles of aspartic acid107, asparagine198 and threonine194. Biochem. Biophys. Res. Commun. 203:1096–1101. (1984) Correlation between histamine-induced neuronal excitability and activation of adenylate cyclase in guinea-pig hippocampus. Neuropharmacology 23:1071–1074. (1989) Pharmacological characterization of histamine receptors in human temporal artery. Br. J. Clin. Pharmacol. 27:139–145. (1978) Pharmacological characterization of histamine receptors mediating the stimulation of cyclic AMP accumulation in slices from guinea-pig hippocampus. Mol. Pharmacol. 14:971–982. (1981a) The distribution of histamine H1-receptors in the rat brain: an autoradiographic study. Neuroscience 6:15–37. (1981b) GABA benzodiazepine and histamine H1-receptors in the guinea pig cerebellum: effects of kainic acid injections studied by autoradiographic methods. Brain Res. 214:155–162. (1989) A human airway smooth muscle cell line that retains physiological responsiveness. Am. J. Physiol. 256:C329–C335. (1994) Endogenous expression of histamine H1-receptors functionally coupled to phosphoinositide hydrolysis in C6 glioma cells: regulation by cyclic AMP. Br. J. Pharmacol. 113:1554–1560. (1981) 3H-Mianserin: differential labelling of serotonin2 and histamine1 receptors in rat brain. J. Pharmacol. Exp. Ther. 216:142–148. (1990) Histamine depolarizes rat medial vestibular nucleus neurons recorded intracellularly in vitro. Neurosci. Lett. 109:287–292. (1982) Histamine and immune responses. in The Pharmacology of Histamine Receptors, eds Ganellin C. R., Parsons M. E. (Wright, Bristol, England), pp 392–435. (1991) Histamine H3 receptors regulate acetylcholine release from the guinea pig ileum myenteric plexus. Life Sci. 48:63–68. (1993) A detailed autoradiographic mapping of histamine H3-receptors in rat brain. Neuroscience 52:169–189. (1994) Mechanism of antihistamine induced sedation in the human brain: H1-receptor activation reduces background leakage potassium current. Neuroscience 59:579–588.